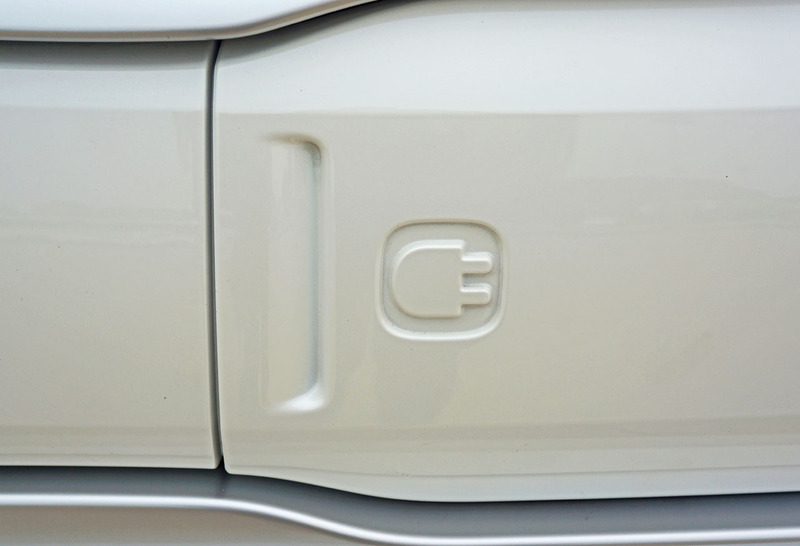 vehicle to electrify. 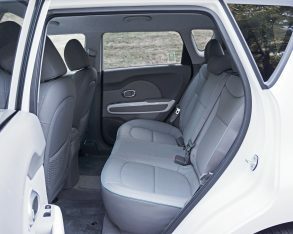 It has enough cabin roominess and cargo capacity for real practicality, while doling out a significant dose of unique style. 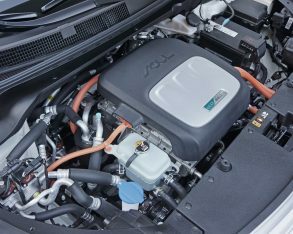 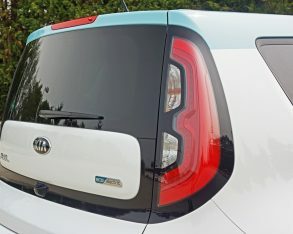 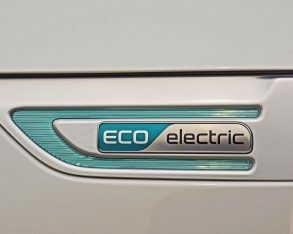 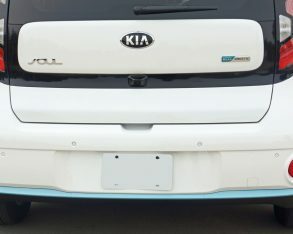 Kia actually claims the compact model was initially designed to accommodate electrification, with the Soul EV only requiring some structural strengthening and a beefier suspension to manage the extra battery weight. 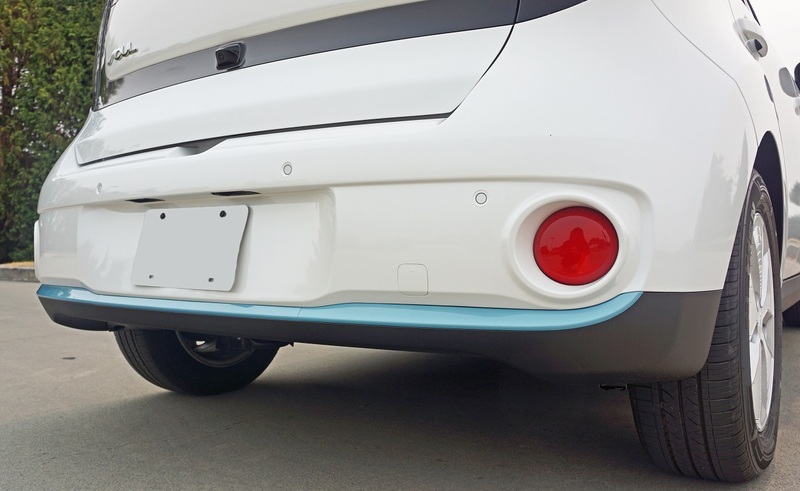 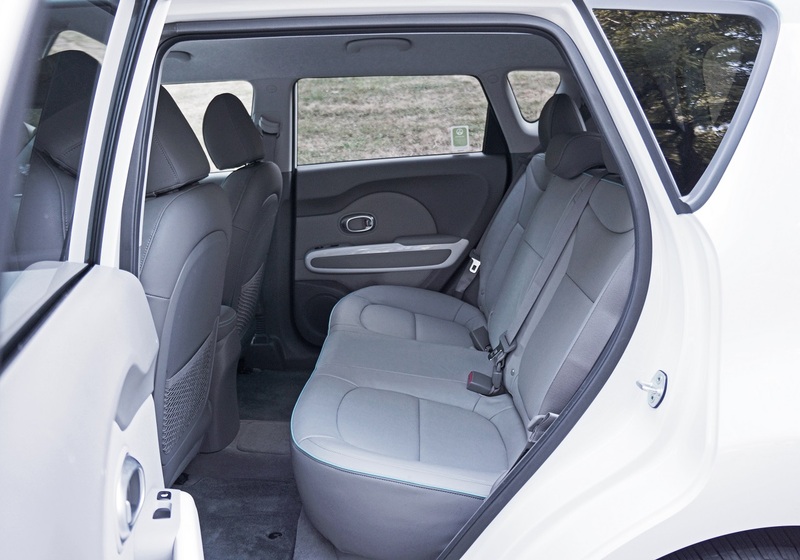 It loses a bit of rear legroom and cargo volume in the transition, but the South Korean company’s innovative plug-in nevertheless becomes the go-to EV for active-lifestyle pragmatists. 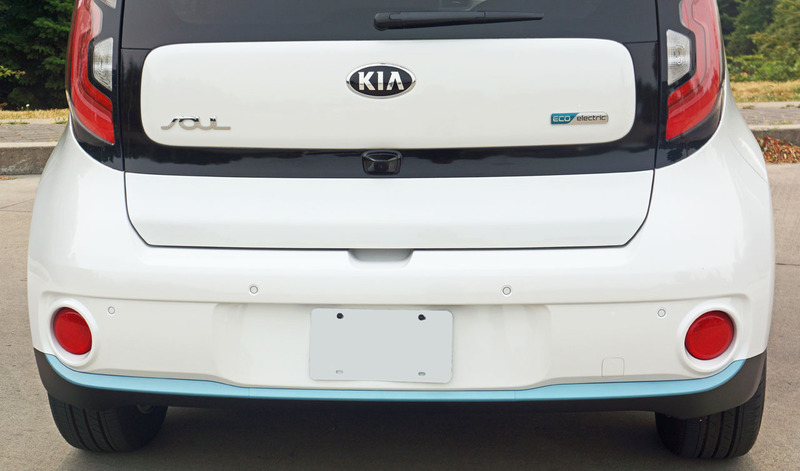 the rear liftgate too. 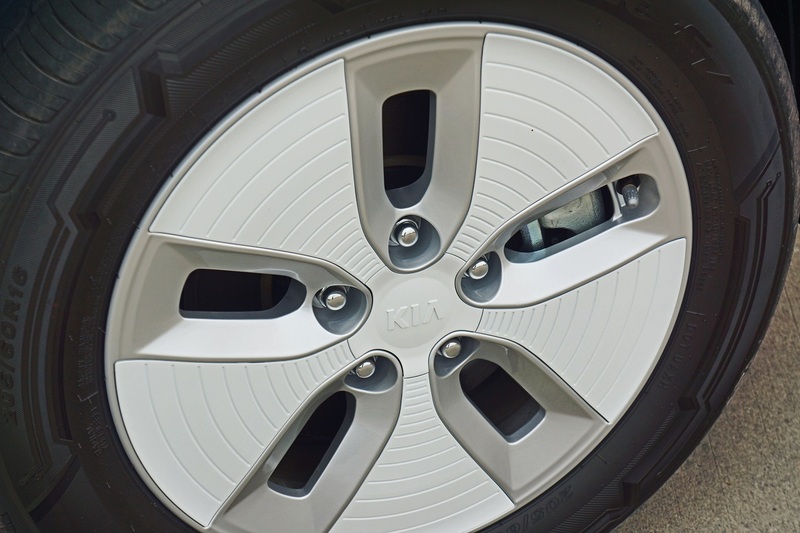 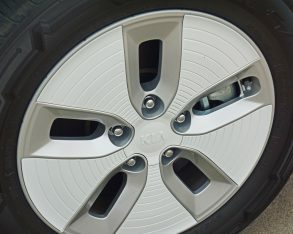 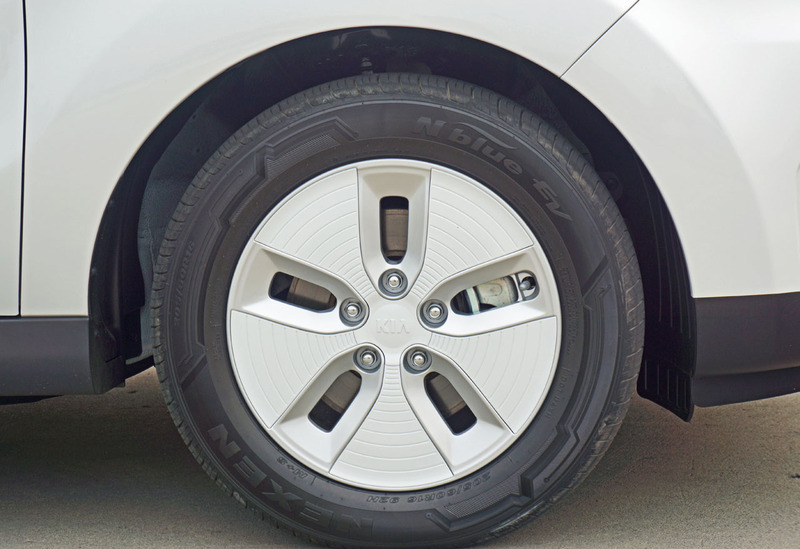 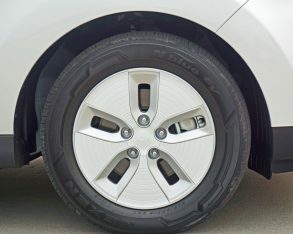 A unique set of aerodynamically designed 16-inch five-spoke alloy wheels are done out in white with silver pockets and circled by 205/60R16 Nexen N blue EV low rolling resistance rubber. 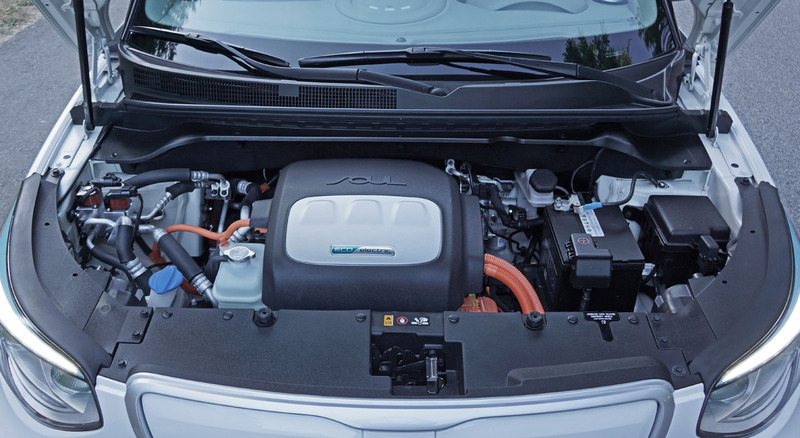 From front to back the Soul EV stands out from the crowd, let alone from its gasoline-powered equivalent. 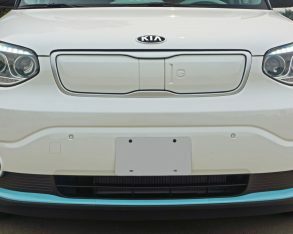 You can forgo all the baby blue trim bits (incidentally dubbed Sky Blue Pearl in Kia-speak) if you delete Pearl White from your order form and instead opt for Electronic Blue, in which case all of the accents will be finished in Pearl White, or alternatively you can choose Onyx Black which will trim out the little EV with racy looking Inferno Red highlights, so at least there’s no excuse to go electric from the available colour palette. 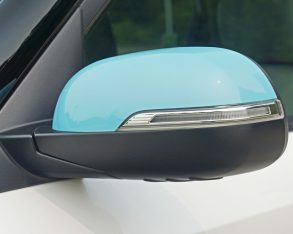 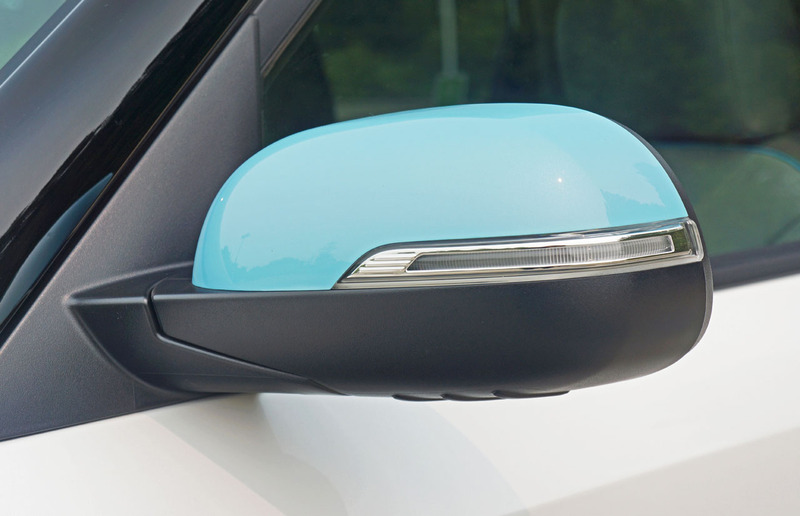 course exterior colour choice will reflect the interior’s styling scheme, mine featuring a two-tone grey and blue motif that my partner and I found quite refreshing. 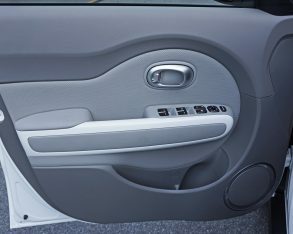 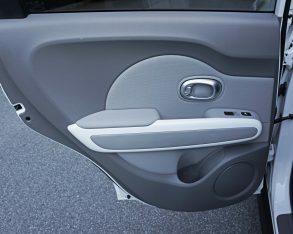 The soft-touch padded and stitched instrument hood was finished in the dark grey, with the rest of the dash top and instrument panel trimmed out in the lighter grey, that is until midway down the IP where it once again went dark, matching the curving extremities of each door panel, while the door inserts and door pull details were finished in the lighter grey. 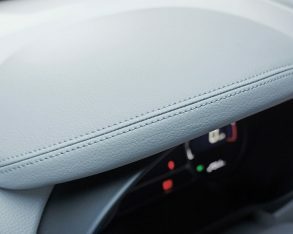 Likewise for the perforated leatherette upholstery, the seats’ lower and top inserts in light grey and bolsters plus outer sections in dark grey, although a nice light blue piping separated the two. 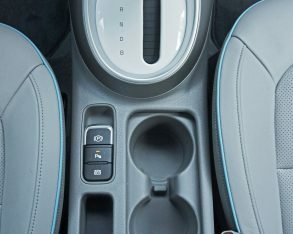 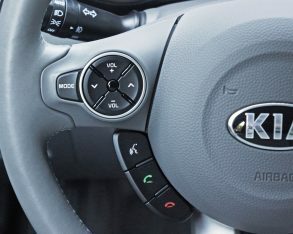 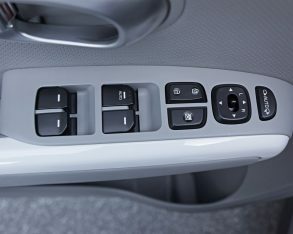 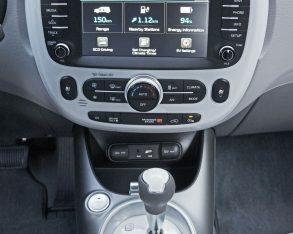 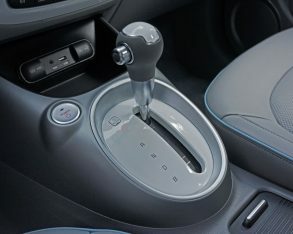 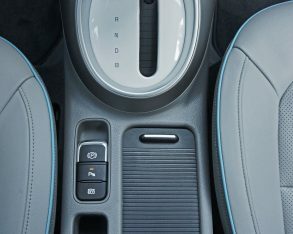 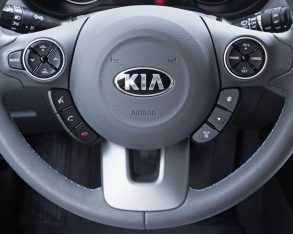 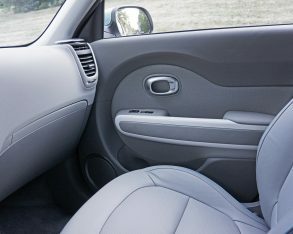 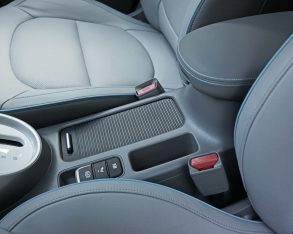 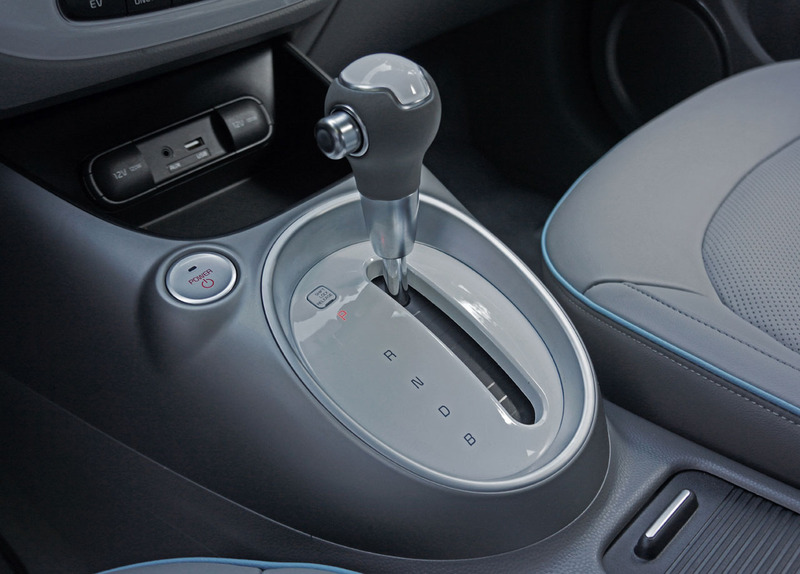 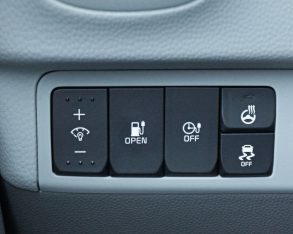 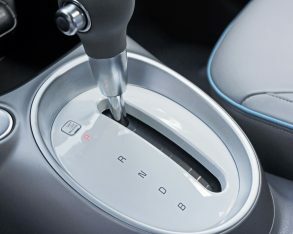 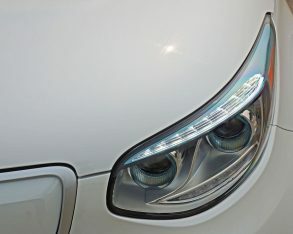 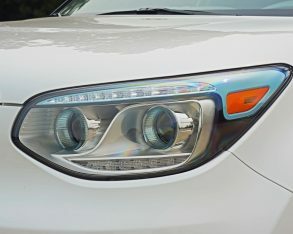 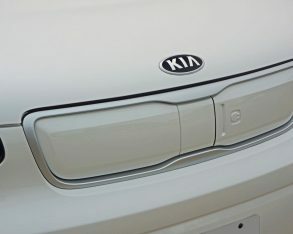 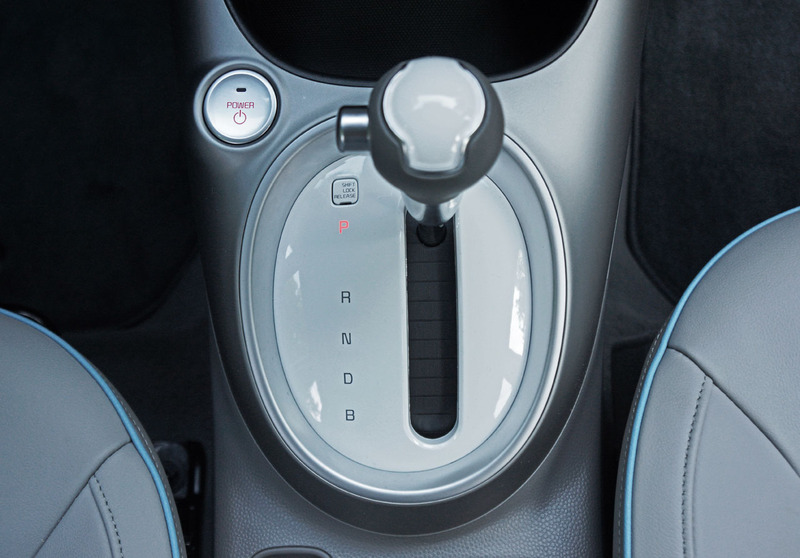 Also of note, Kia surrounded all centre stack controls in a glossy body-colour white, matched by the same body-color treatment around the shifter, the top of the shift knob, and highlighting the door armrest garnishes front to rear, while attractive satin-silver accents were dispersed throughout the cabin. 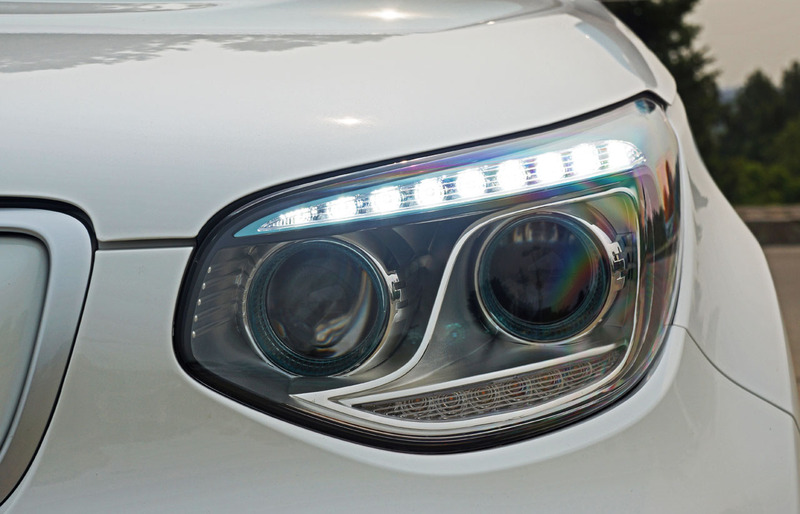 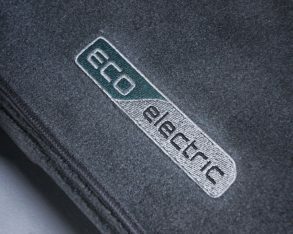 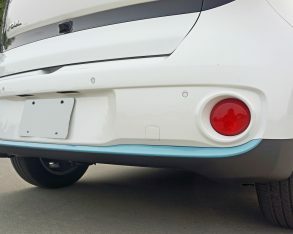 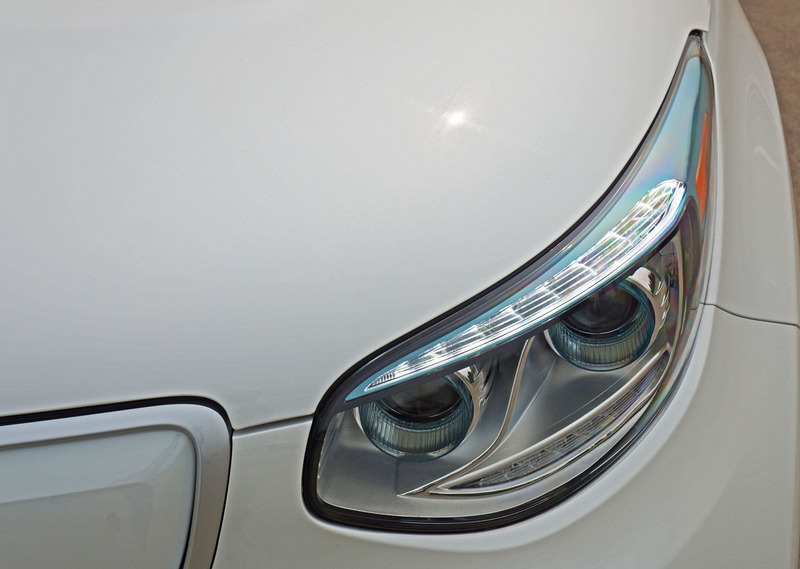 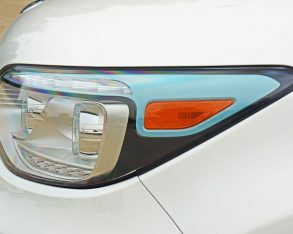 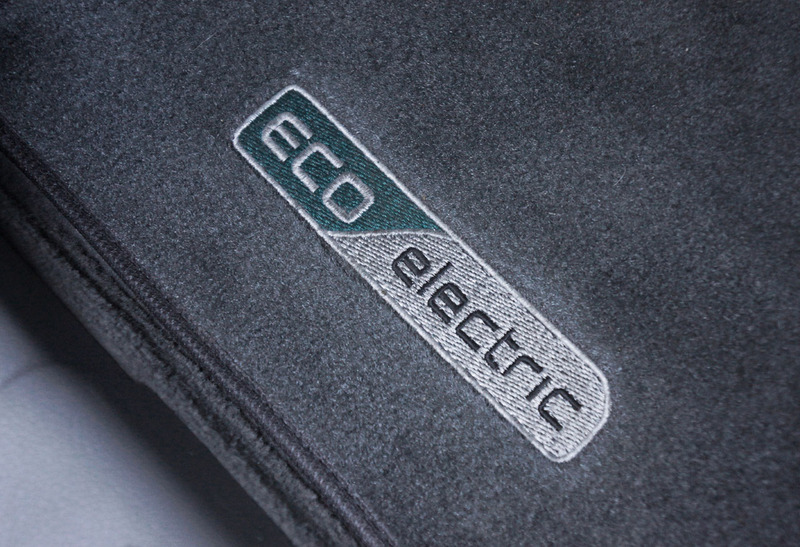 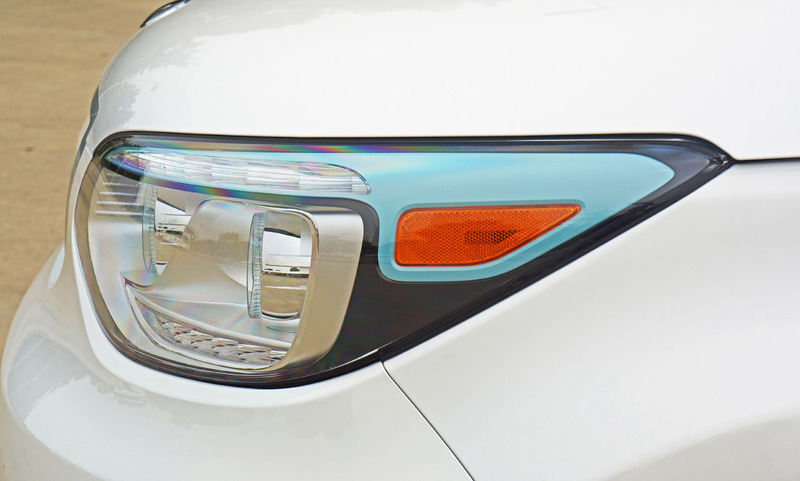 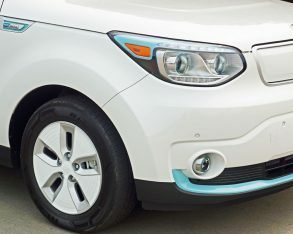 of this pampering is nice, but Soul EV buyers can be especially proud that their car’s premium accoutrements are friendlier to mother earth than most other cars populating our planet. 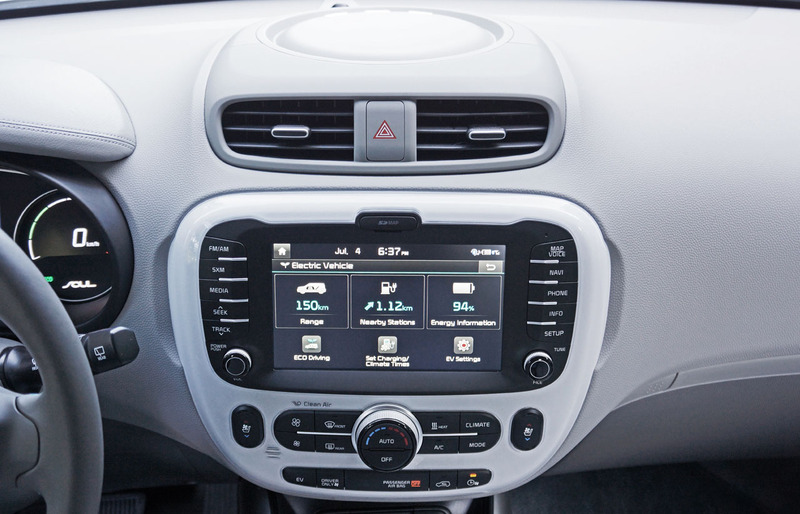 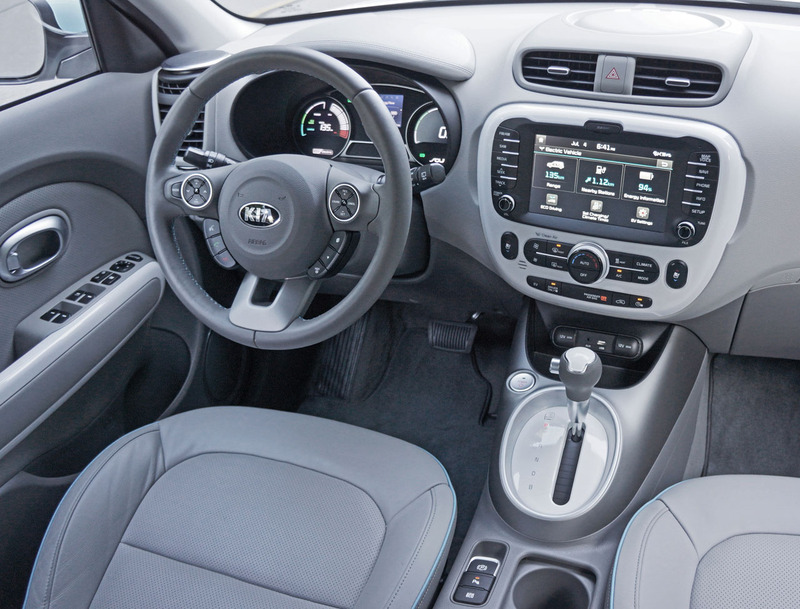 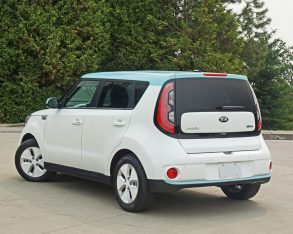 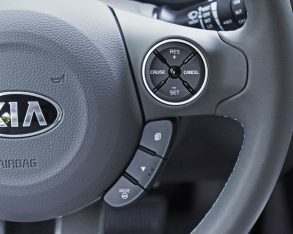 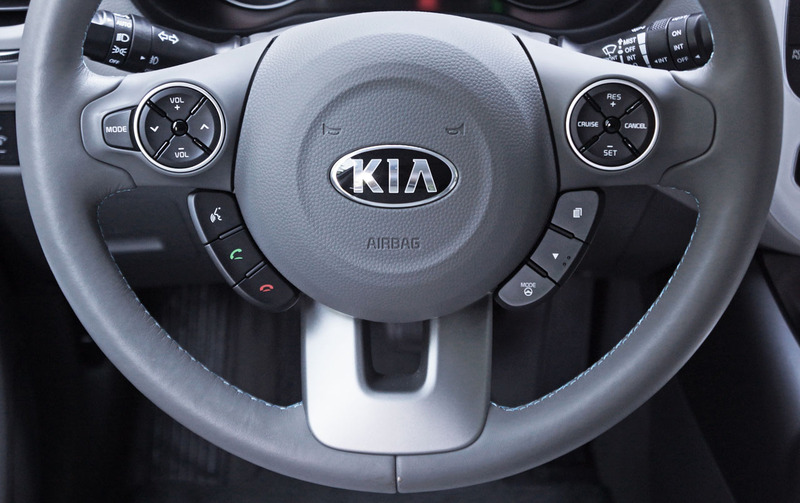 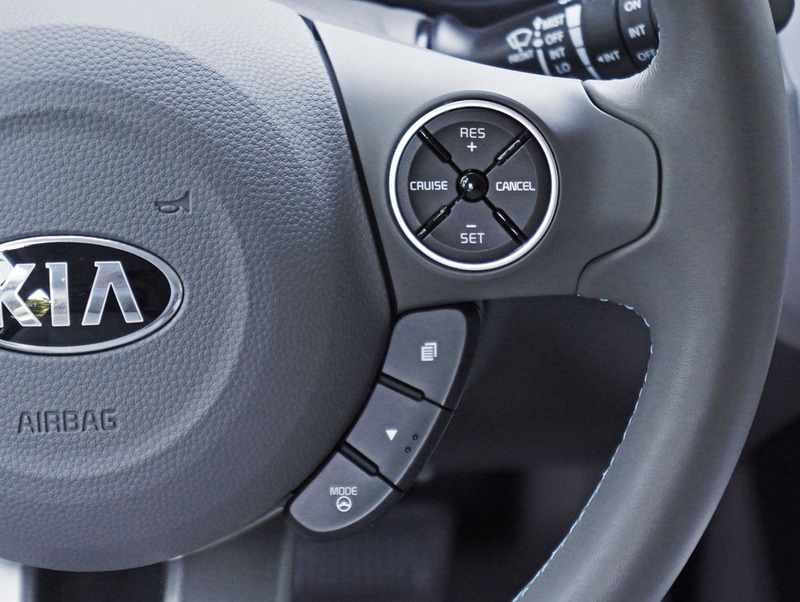 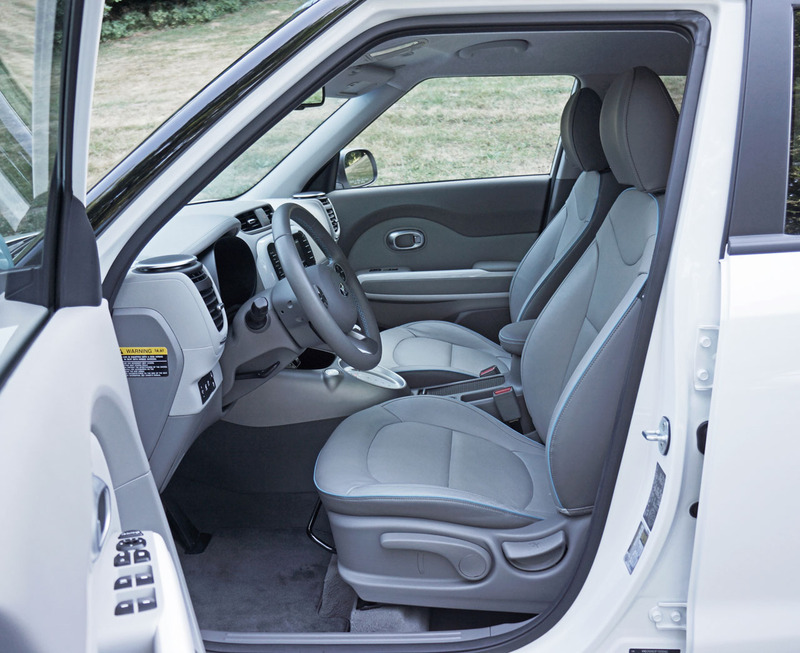 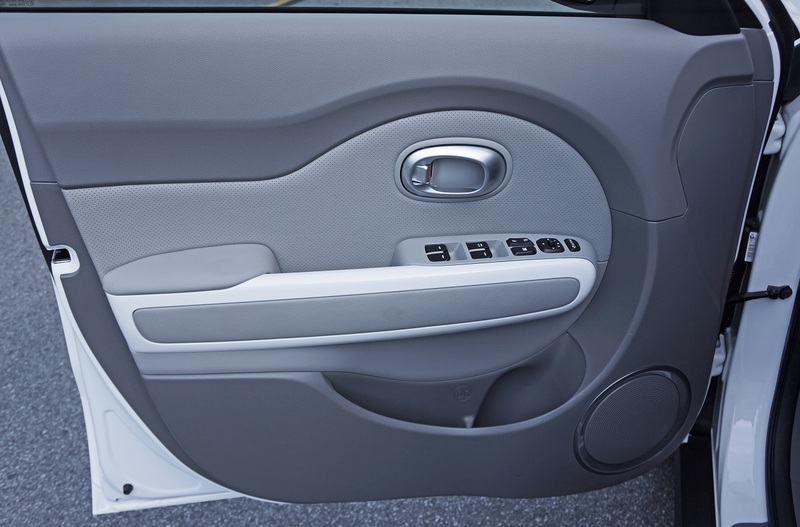 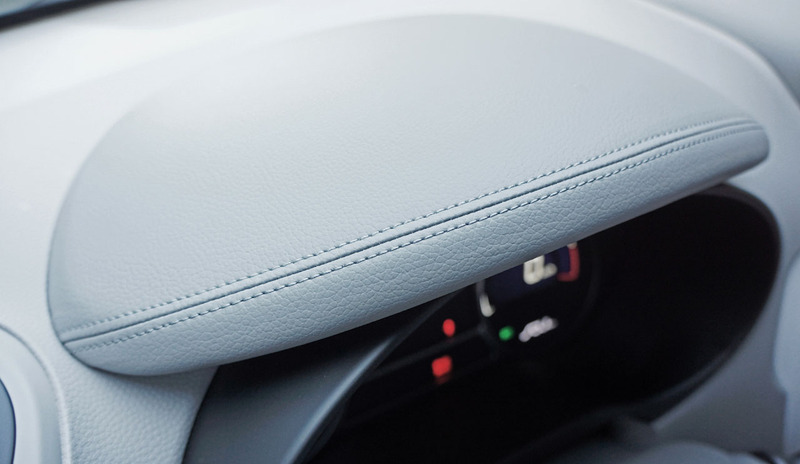 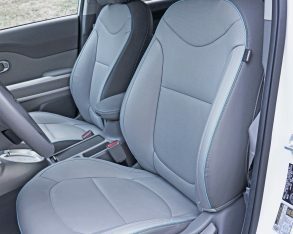 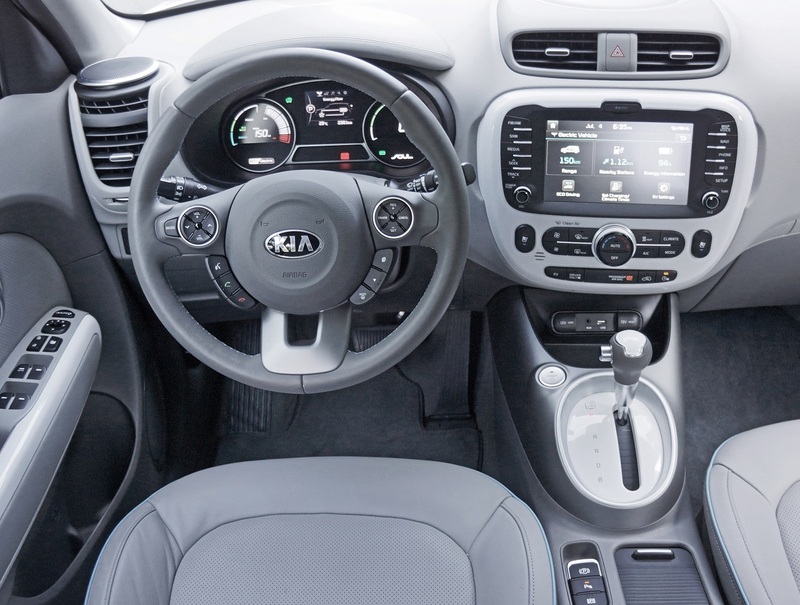 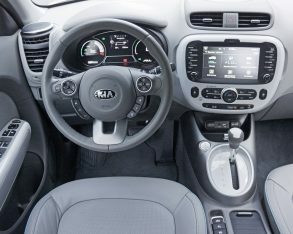 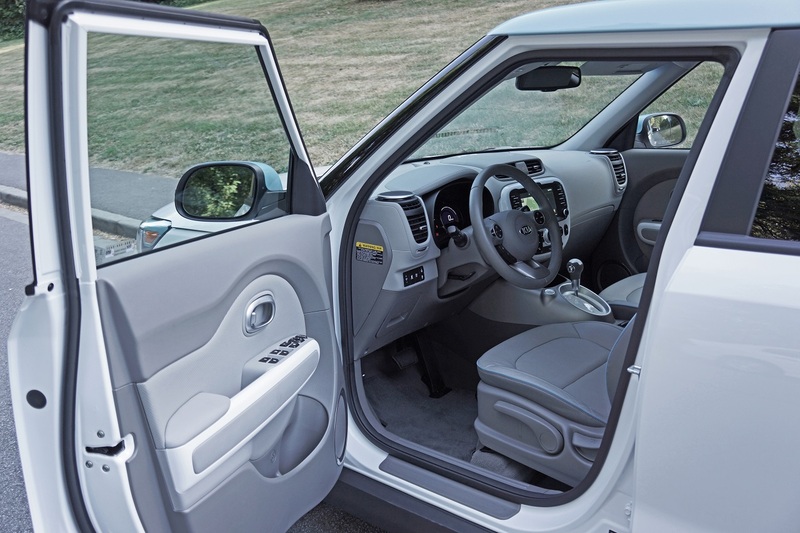 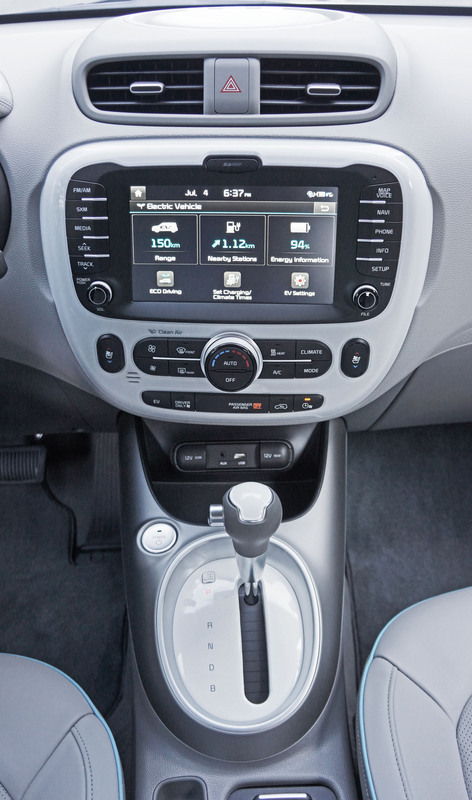 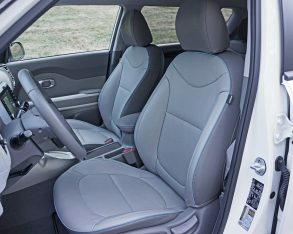 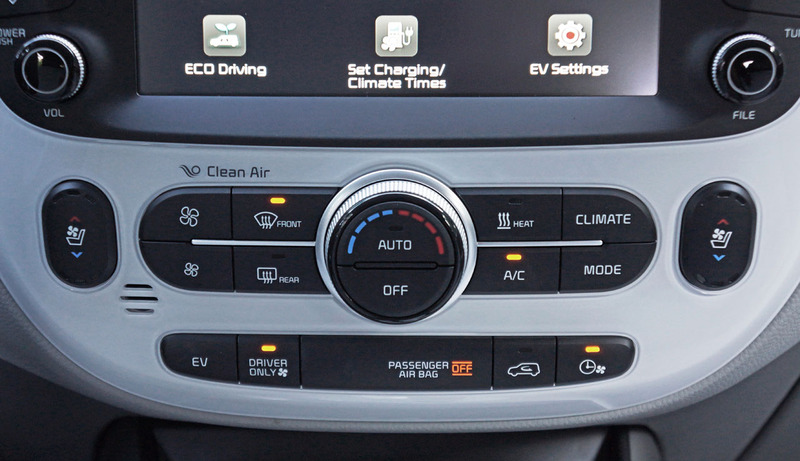 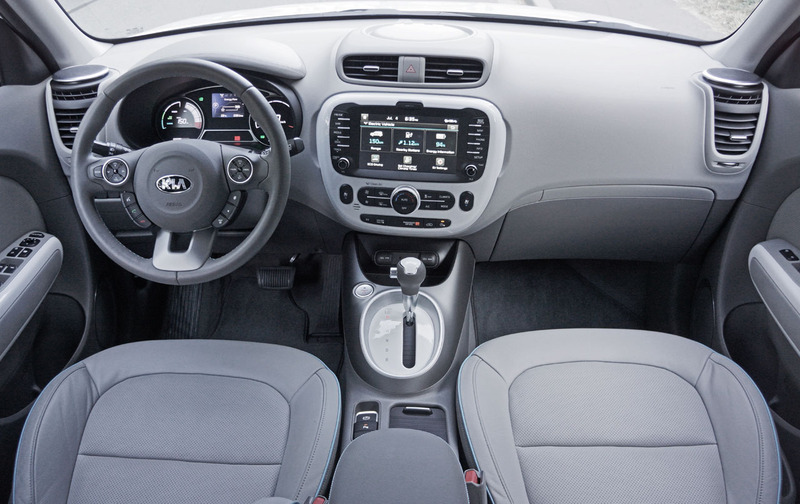 Nineteen parts of its entire interior mass are derived from bio-based materials, earning the first and only UL environmental claim validation in the industry, says Kia. 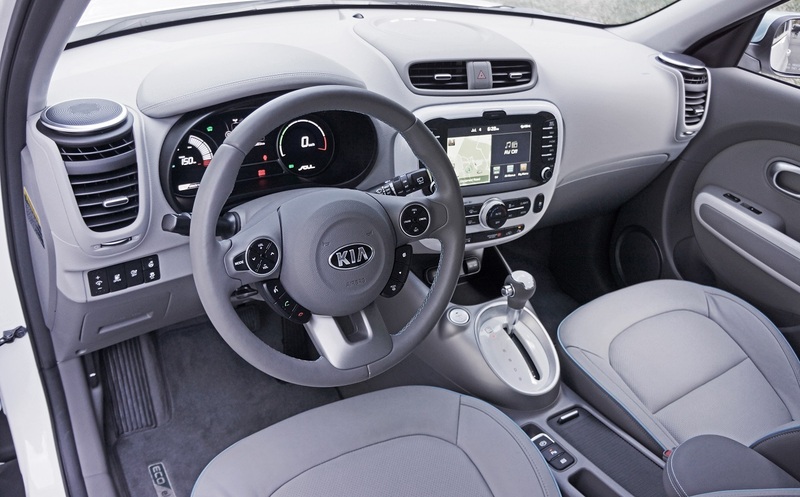 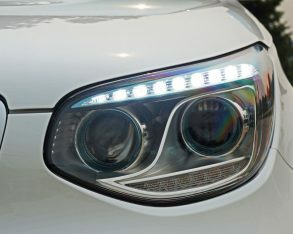 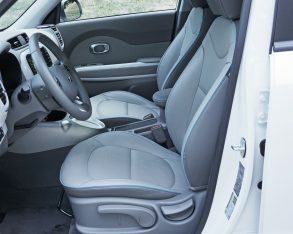 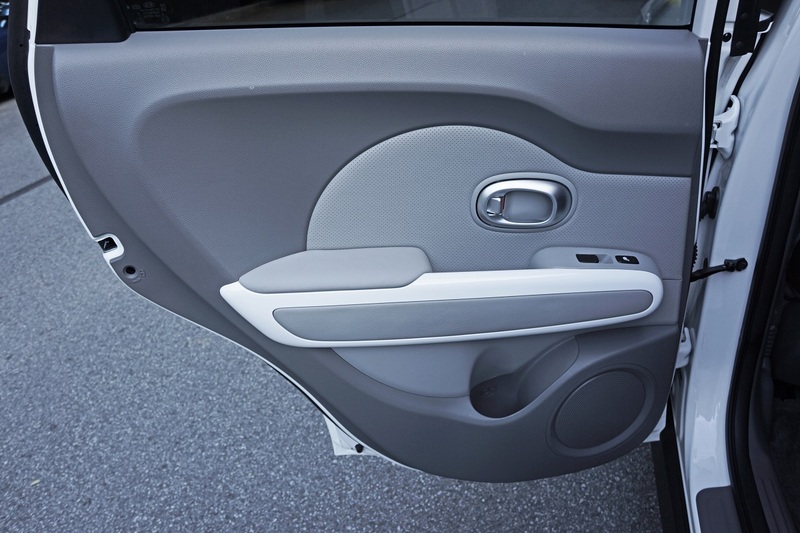 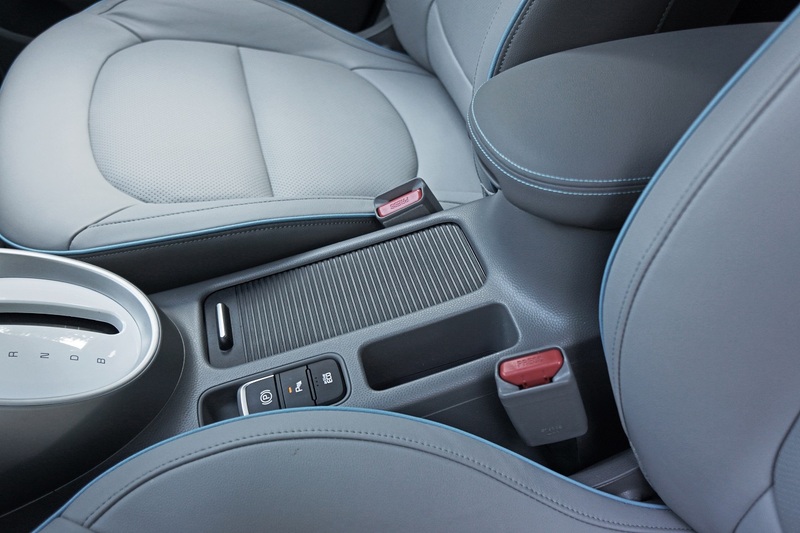 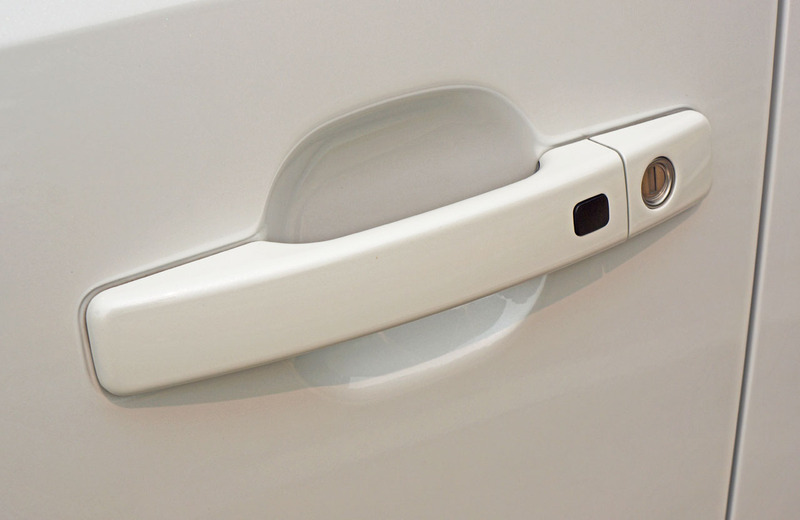 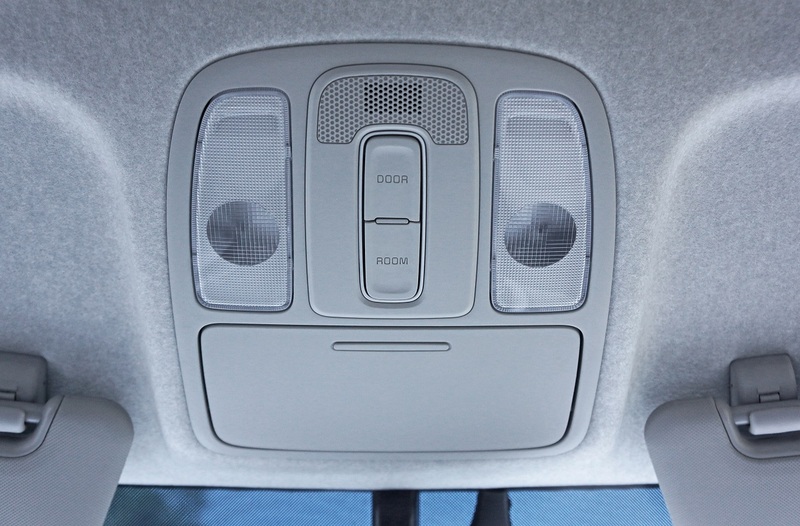 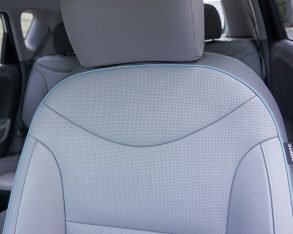 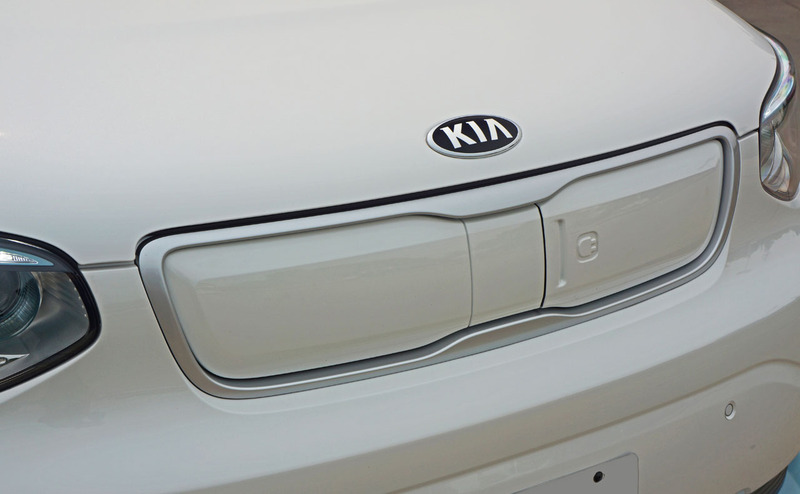 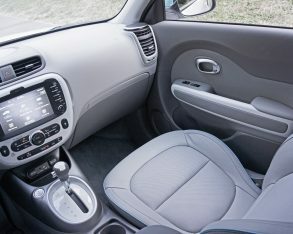 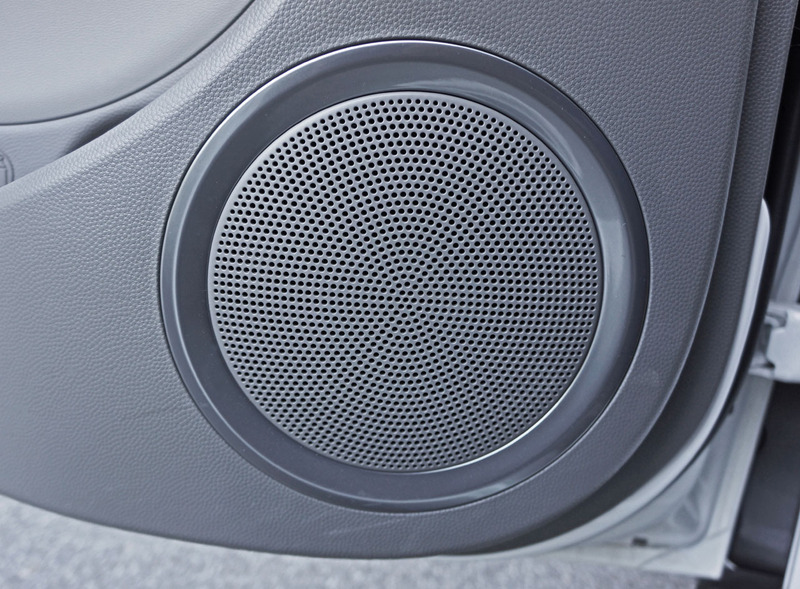 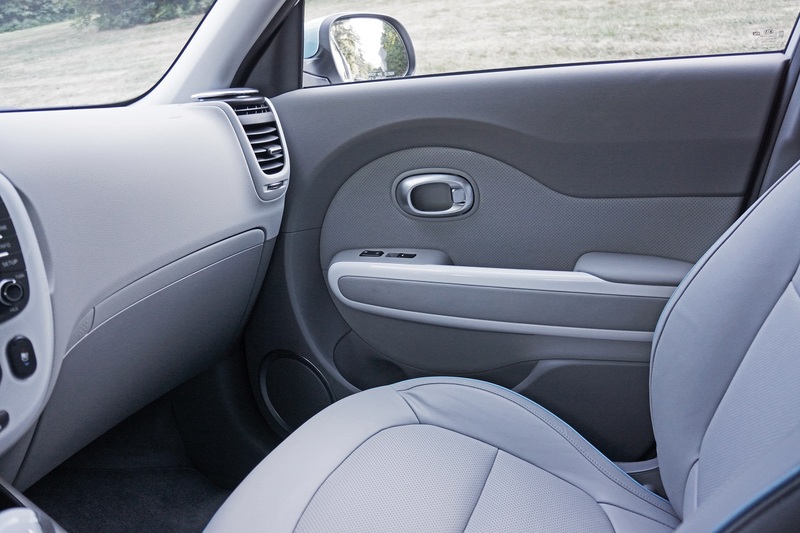 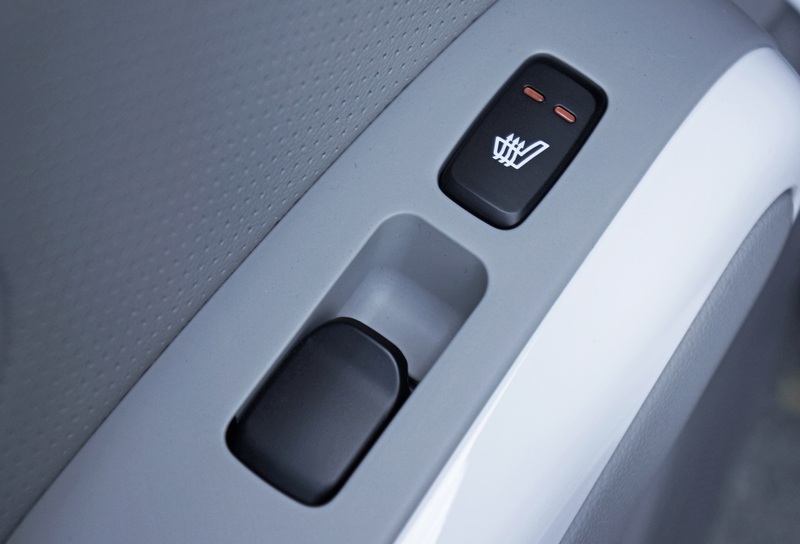 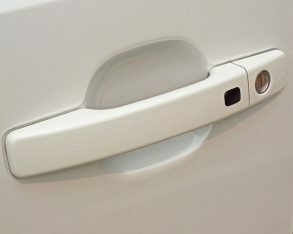 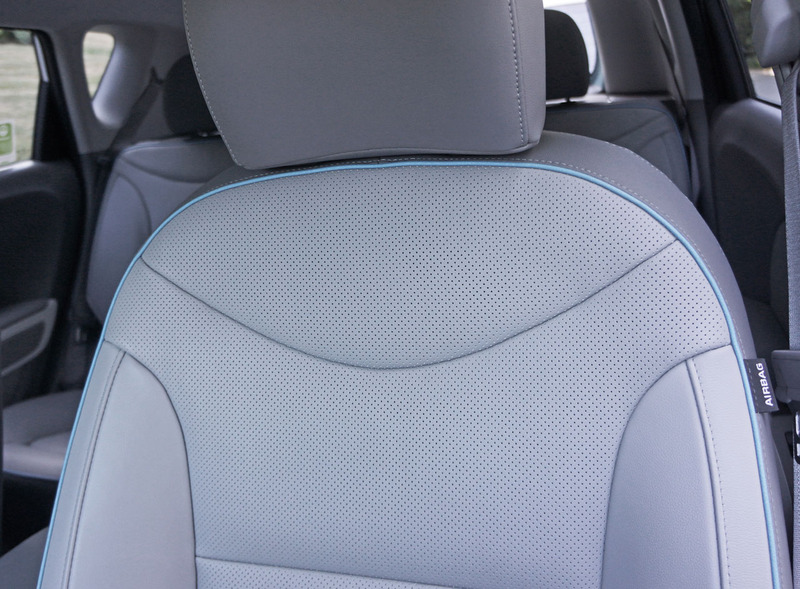 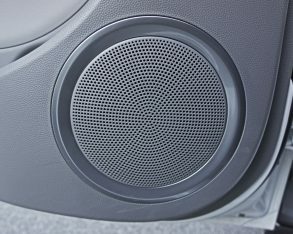 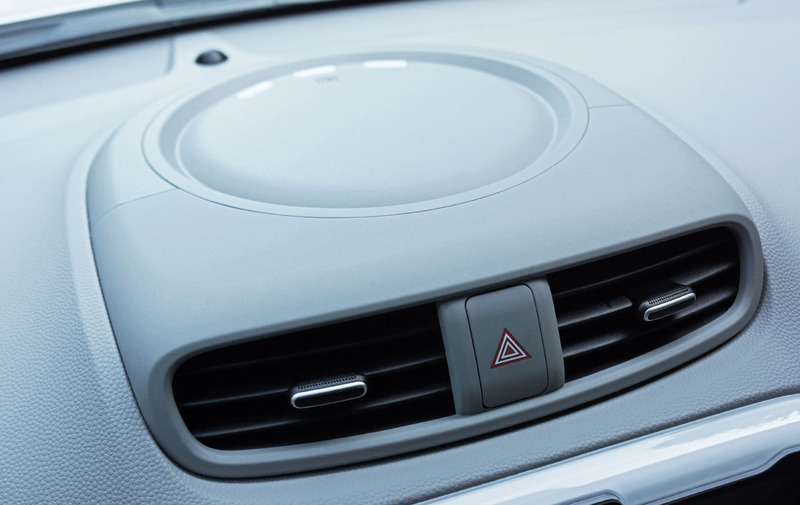 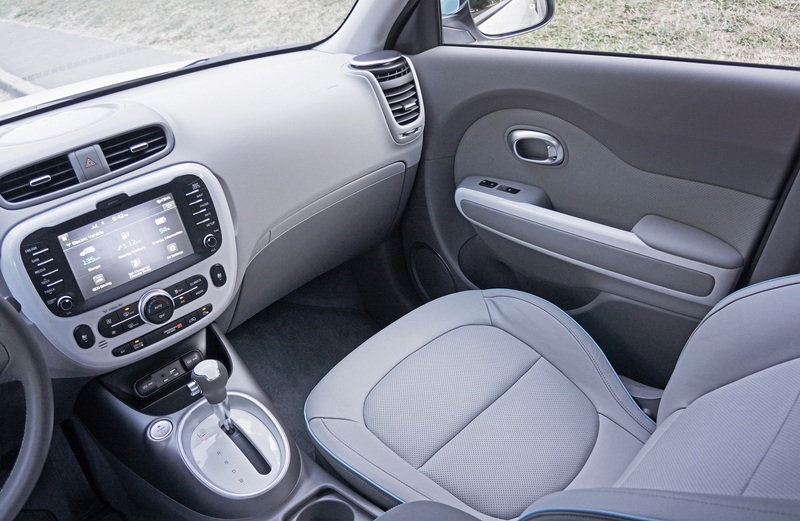 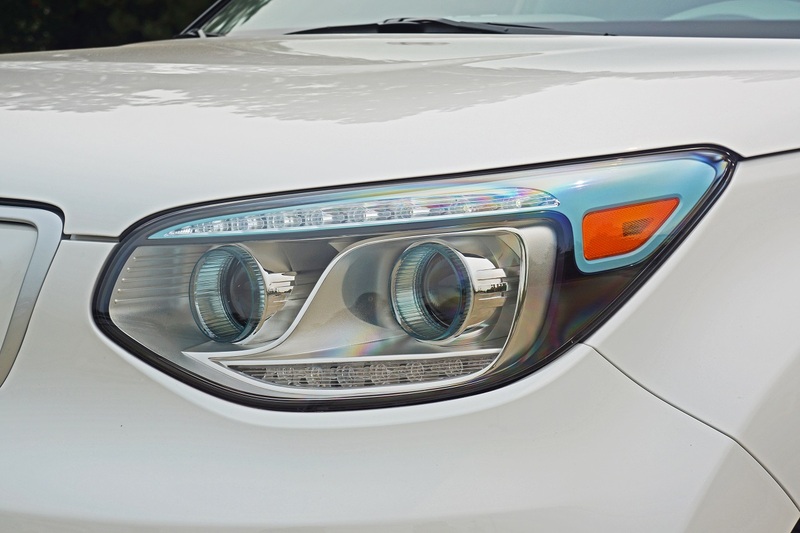 Additionally, Kia made sure that harmful chemicals like benzene weren’t used for painted interior surfaces, while sugar cane and corn were chosen to create the cabin’s plastics. 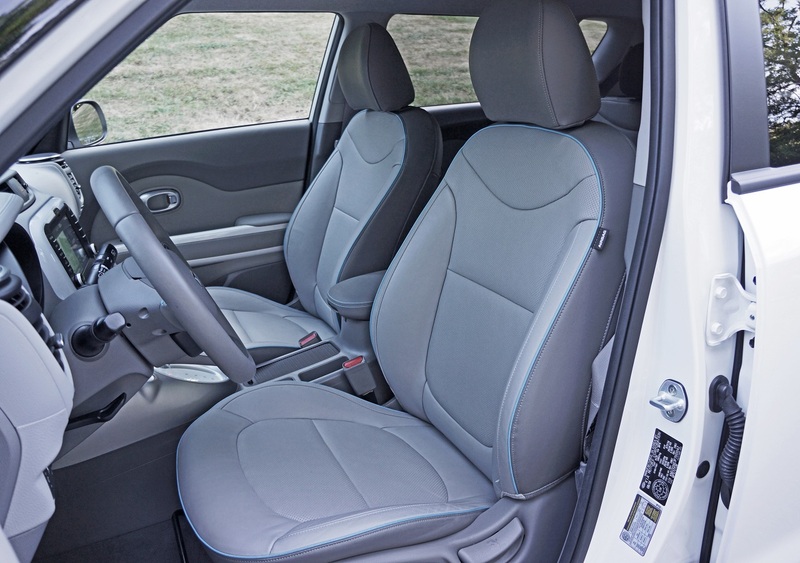 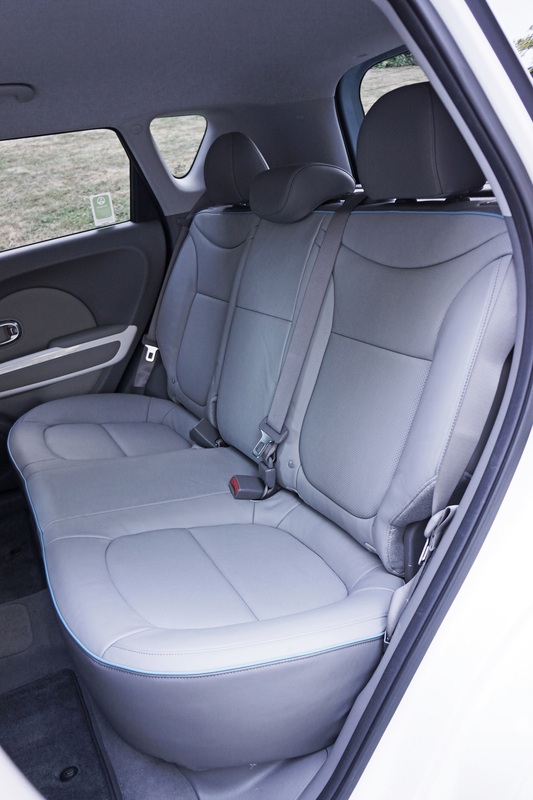 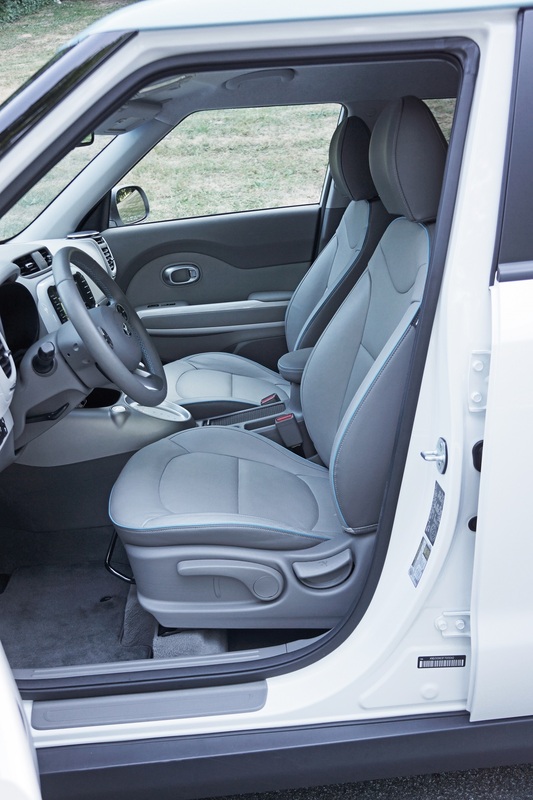 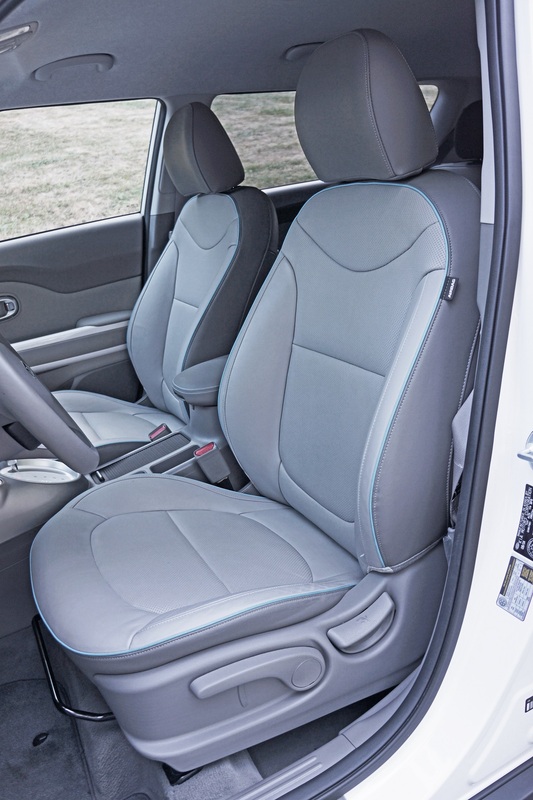 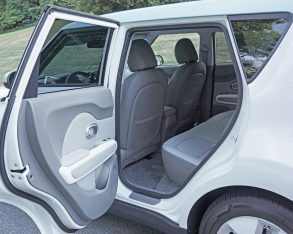 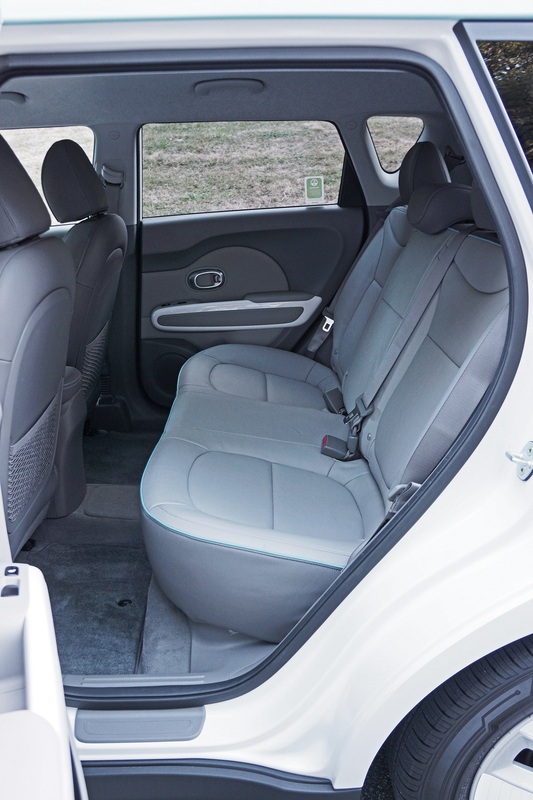 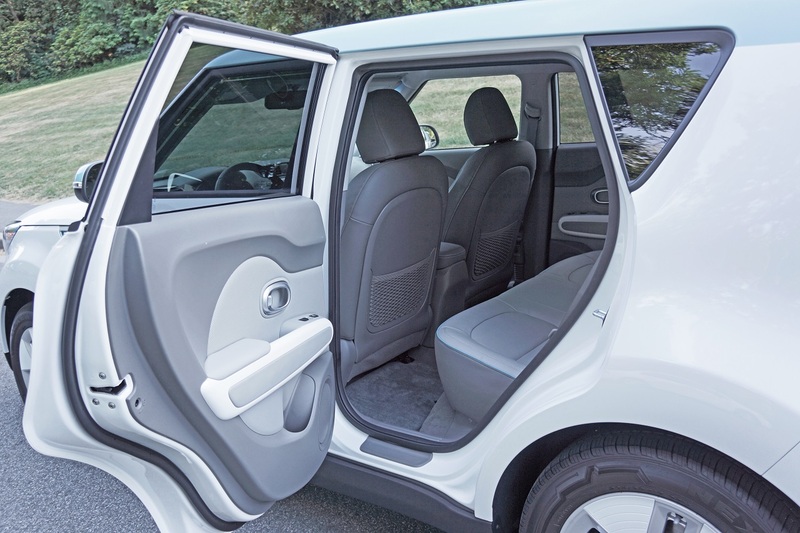 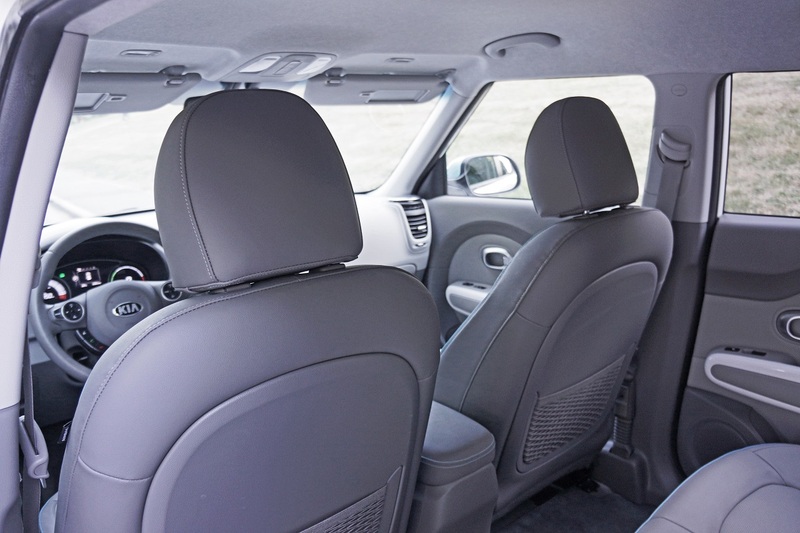 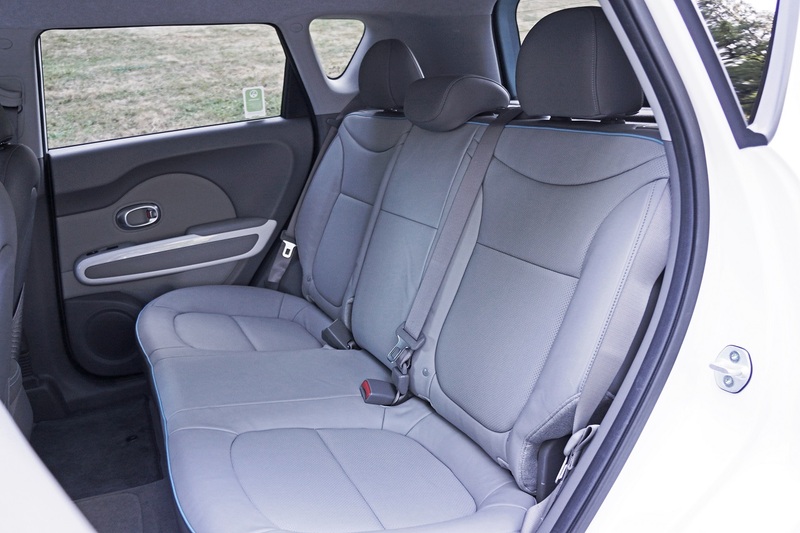 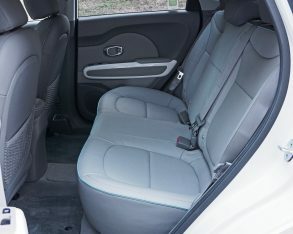 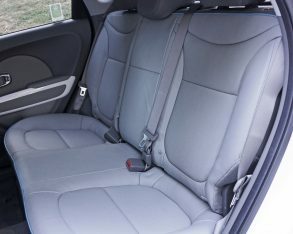 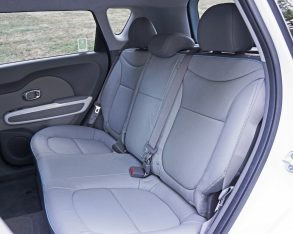 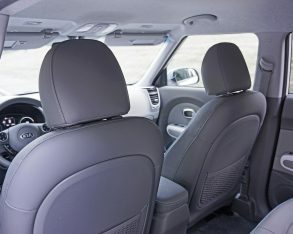 been a mistake, but I didn’t expect the level of luxury Kia offers in the Soul EV, with that padded soft synthetic dash top also joined by soft front door uppers, whereas the door inserts were done out in a perforated leatherette to match the seat inserts. 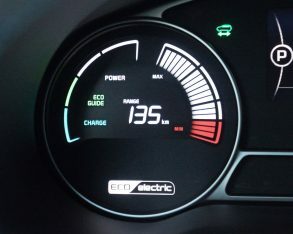 It was all very nice, giving compact buyers yet another reason to go electric. 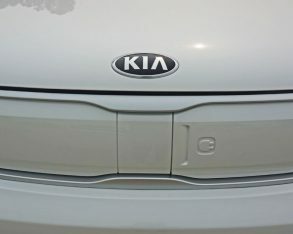 But hold on, it gets better. 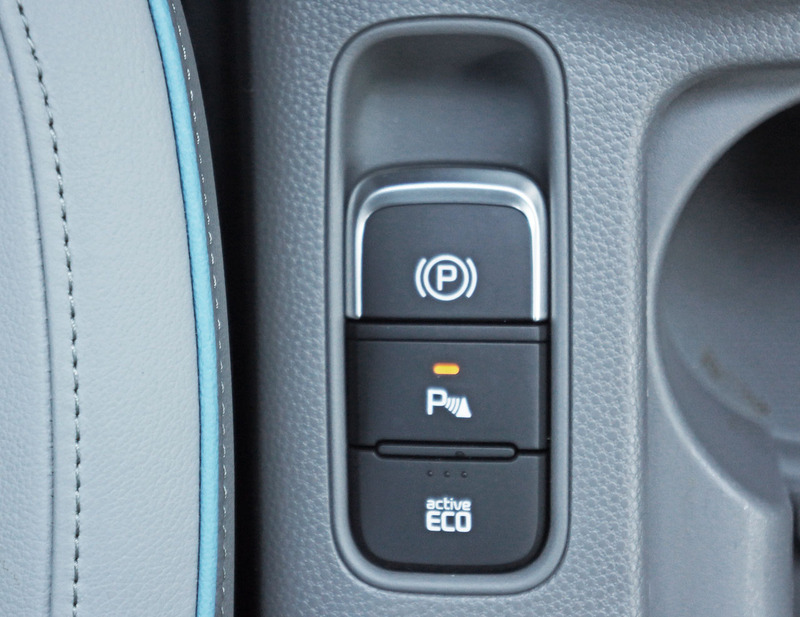 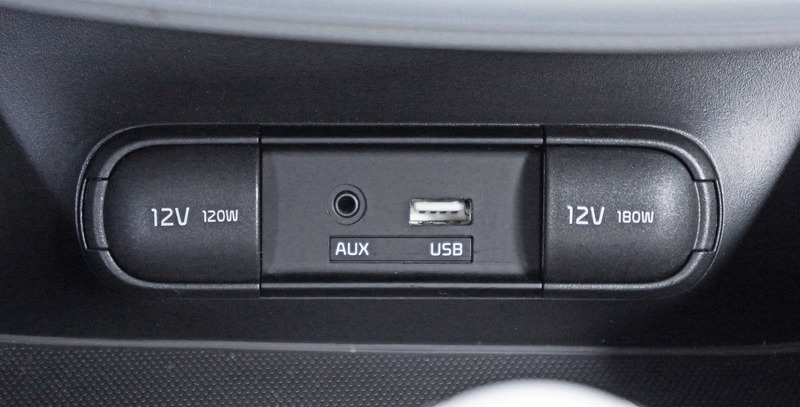 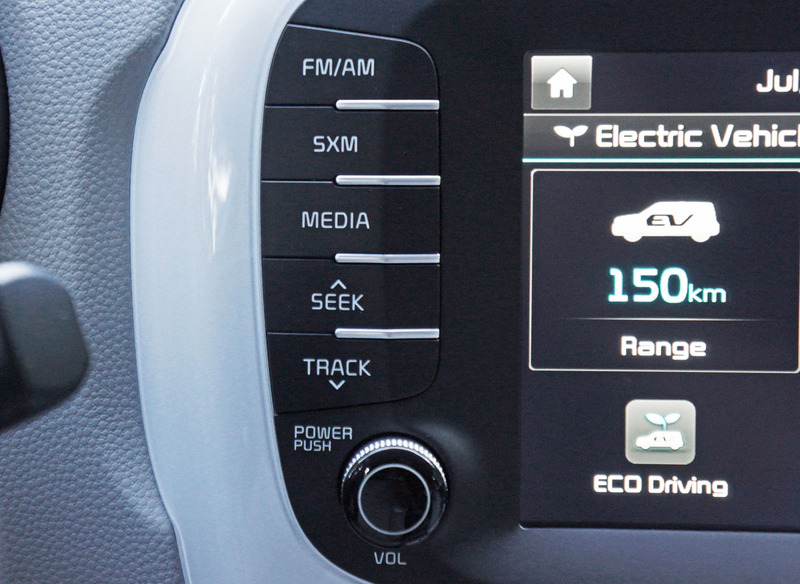 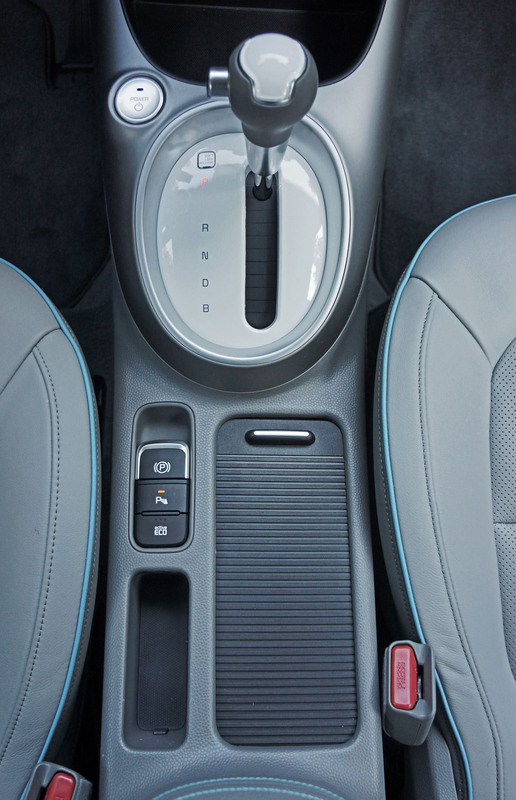 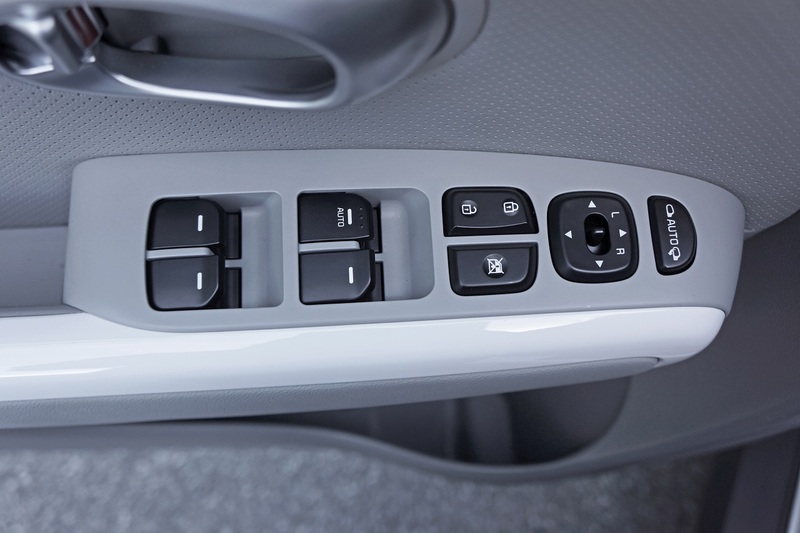 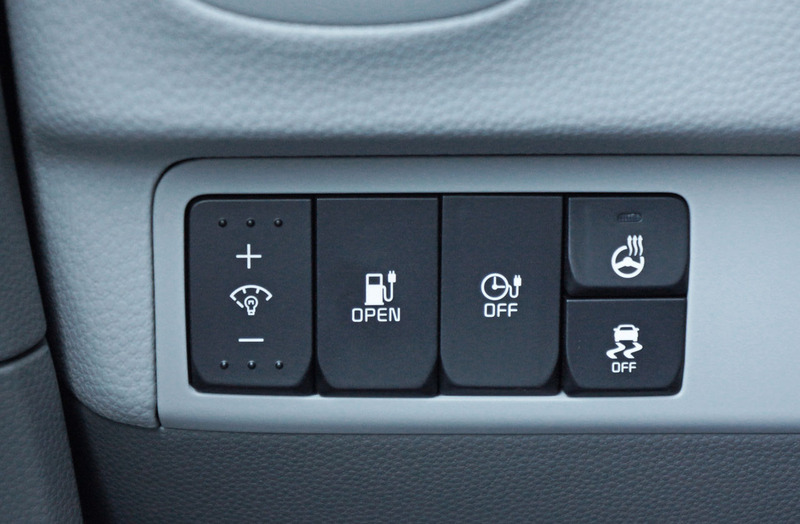 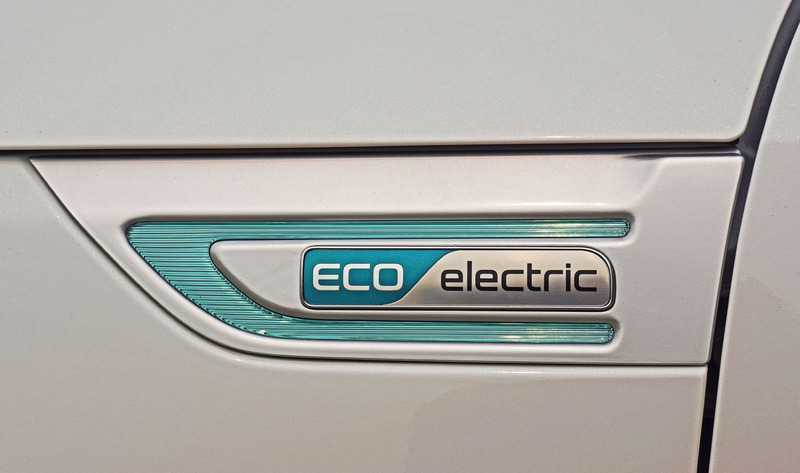 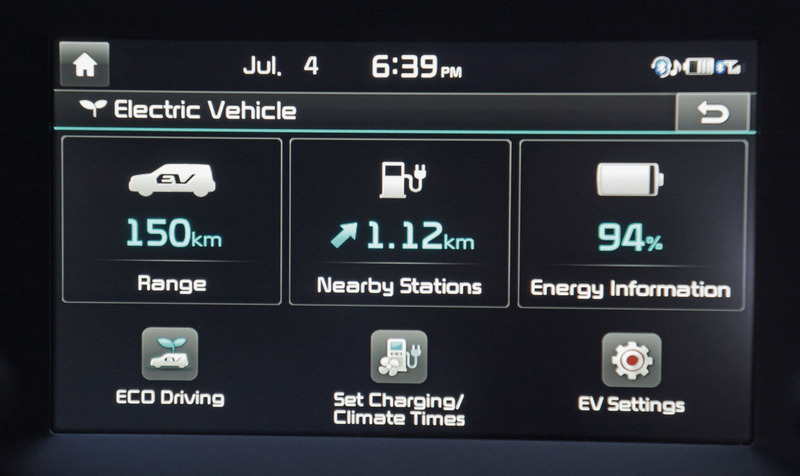 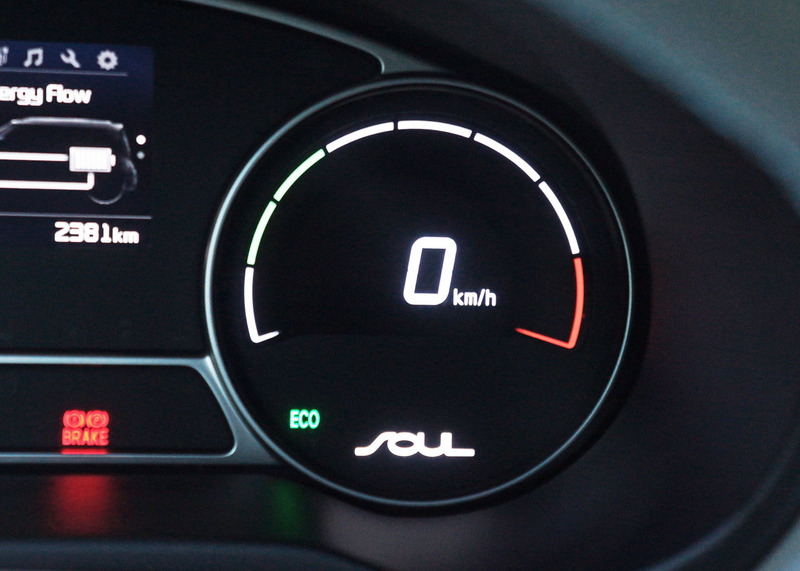 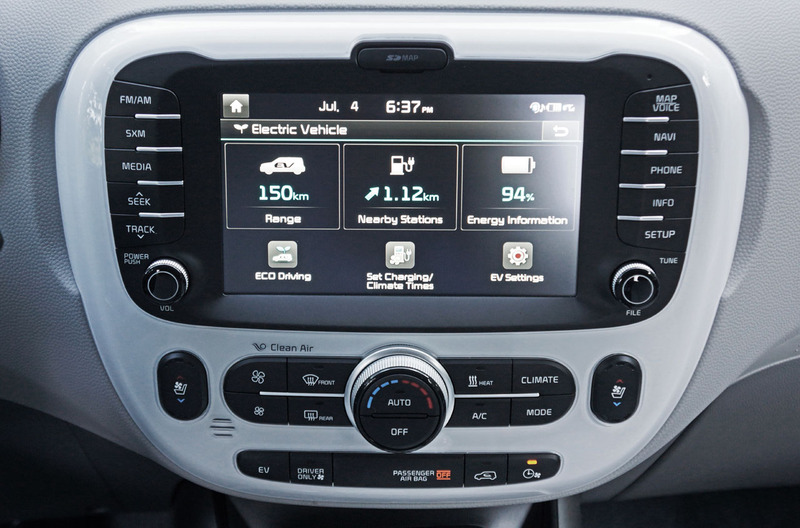 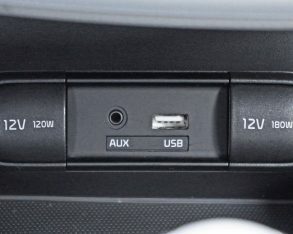 As with the regular Soul, all of the EV’s switchgear and graphic interfaces are first-rate. 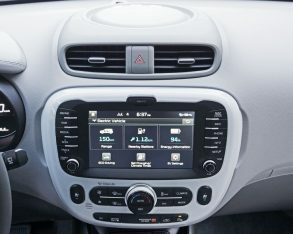 The primary instruments are entirely made up of brilliantly clear high-resolution full-colour TFT displays that are fully active and driver programmable. 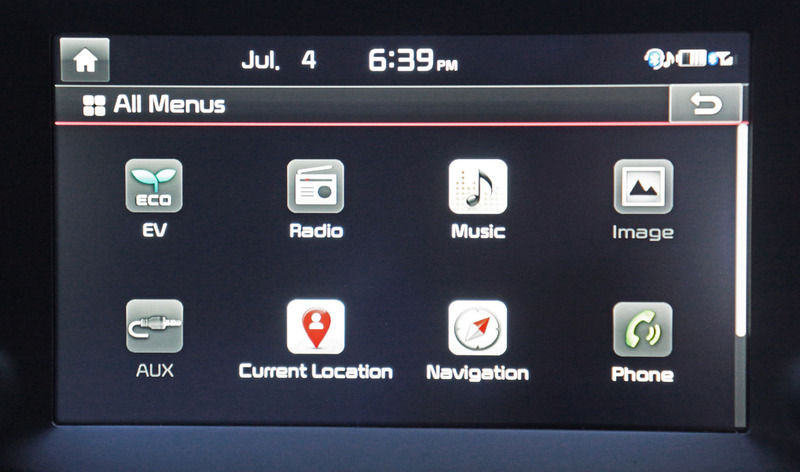 Likewise, the infotainment display is one of the best I’ve ever seen in any car. 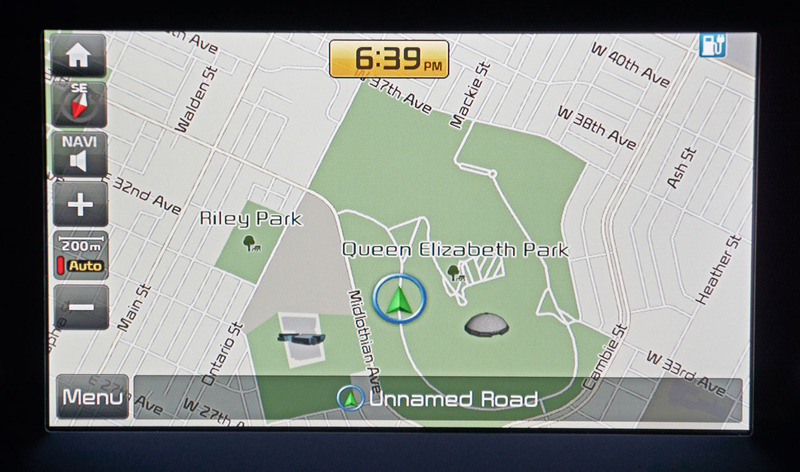 The graphics are superb, resolution crystal clear and ultra crisp, colour rich and overall functionality excellent. 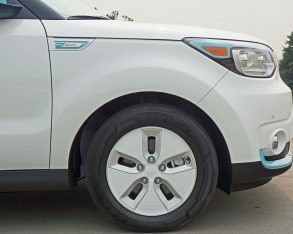 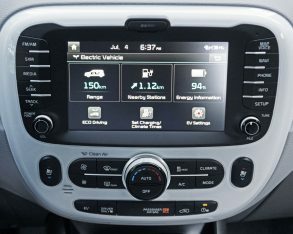 with the usual audio and phone features the Soul EV’s UVO system included navigation, nice for a base yet fully stocked compact, and a separate EV screen that showed estimated range, nearby recharging stations, available battery life, and other EV-specific settings. 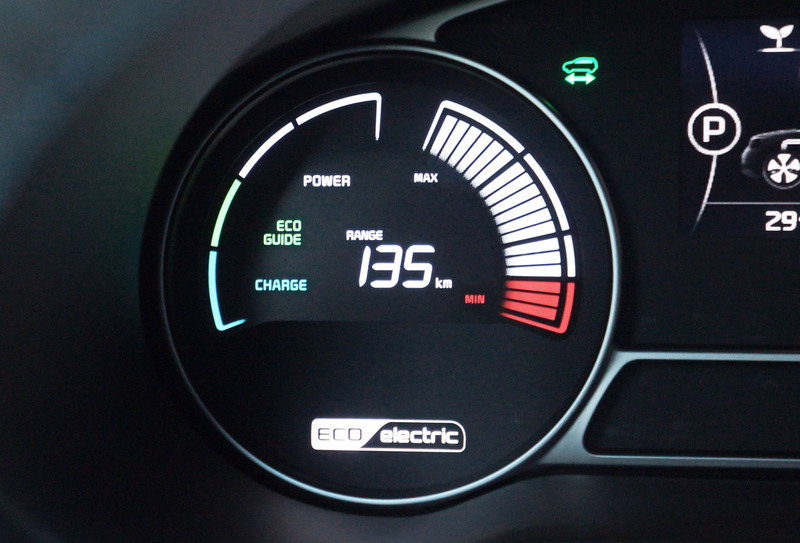 minutes, the Soul EV being one of few electric cars available with an 480-volt DC charger to meet this fantastical claim, but before you start thinking their numbers are akin to one of the federal party’s campaign promises, note that the results don’t jive because there are precious few DC charge stations in Canada as of yet. 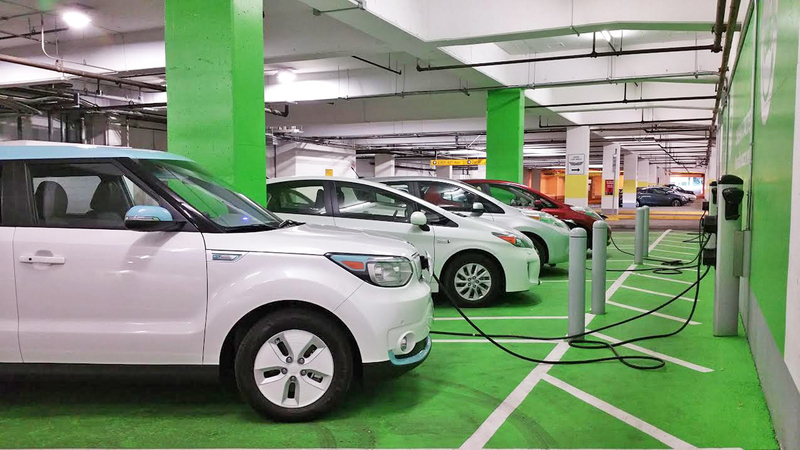 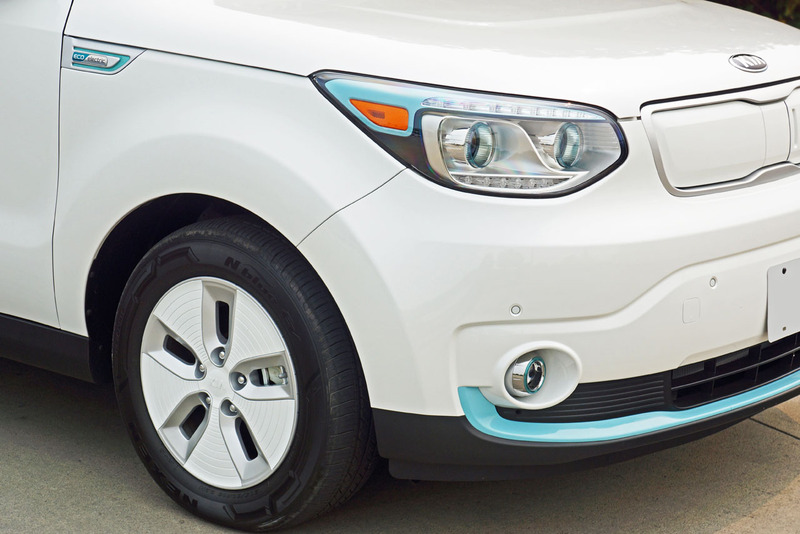 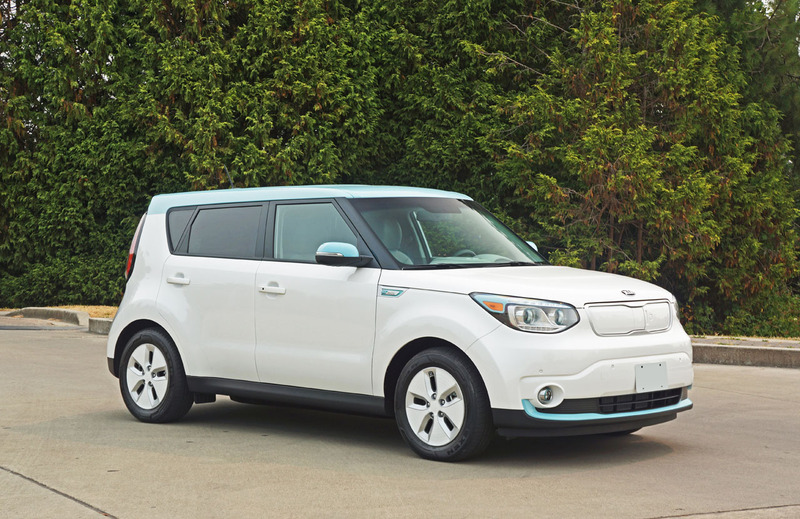 Just the same, Soul EV buyers can at least rest assured that they’re prepared for the future. 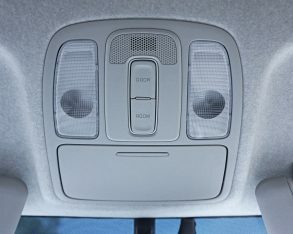 windows down. 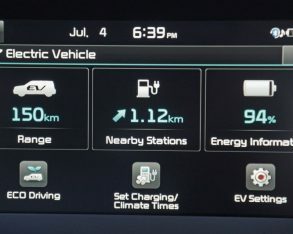 I also rarely extracted all 109 horsepower and 210 lb-ft of torque from the AC synchronous motor, instead consciously trying to get as far as possible on a single charge. 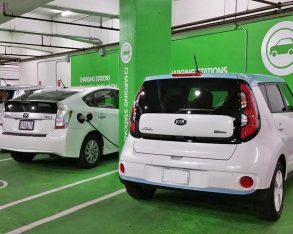 to recharge it three times within a week’s worth of driving, the first a partial charge just after receiving it, the second a full charge that lasted the better part of the week, and the final one a courtesy charge the day before returning it. 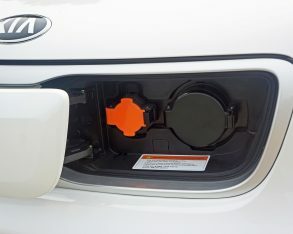 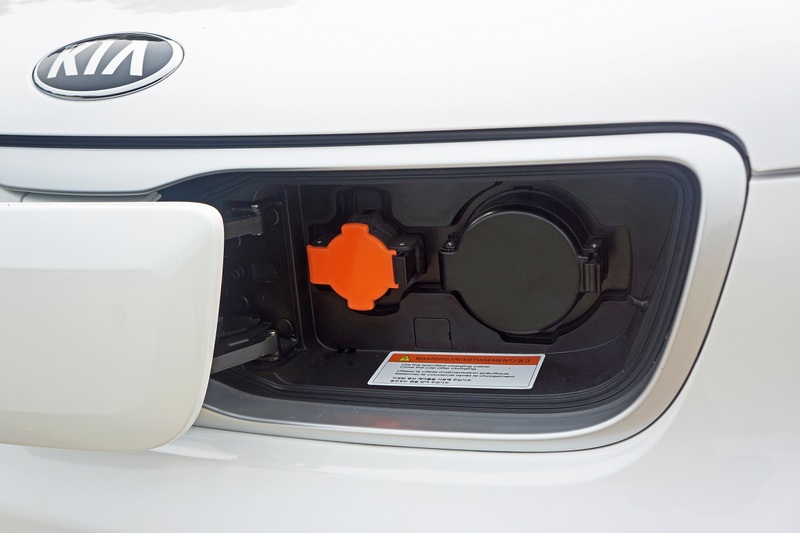 mentioned, by the way, and the same one used at all the charging stations, so Kia’s charge claim is very conservative, as you’ll remember mine exceeded their range estimate in only four hours. 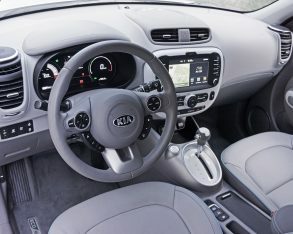 and high-gloss white interior detailing I mentioned earlier, plus an electronic parking brake, a tilt and telescopic leather-wrapped multifunctional steering wheel that’s also heatable and features Kia’s driver-selectable steering-feel system that let’s you choose between Comfort, Normal and Sport settings, an Eco driving mode, a leather-wrapped shift knob, the LED instrument cluster and multi-information display I went on at length describing, cruise control, automatic climate control, bio-fabric upholstery, two 12-volt power outlets, and finally the eight-inch infotainment touchscreen with navigation, a rearview camera, and an AM/FM/MP3 audio system featuring satellite radio, USB input and more. 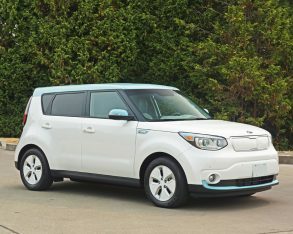 about there I’d probably call a halt to the spending spree because the Soul EV is about as well equipped as most luxury cars, and as mentioned, about as nicely finished inside, but nevertheless Kia offers its EV Luxury trim for those who want it all, so for $37,995 plus freight you’ll also get fog lights, aeroblade wipers, automatic power-folding side mirrors, the leatherette upholstery and door trim I noted earlier, ventilated front seats that helped cool things down amid summer’s heat, heatable rear seats that obviously weren’t needed but would no doubt come in handy during winter, front and rear parking sensors that are always appreciated, a cargo net, a cargo cover, a 12-volt cargo area power outlet, a heat pump that allowed for EV range-enhancing climate control, and that future-think 480-volt DC fast-charging system. 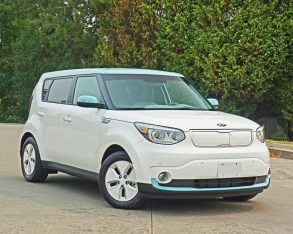 I was more than impressed by the Soul EV’s standard and optional features, I had one problem that I’ve never experienced before in any car. 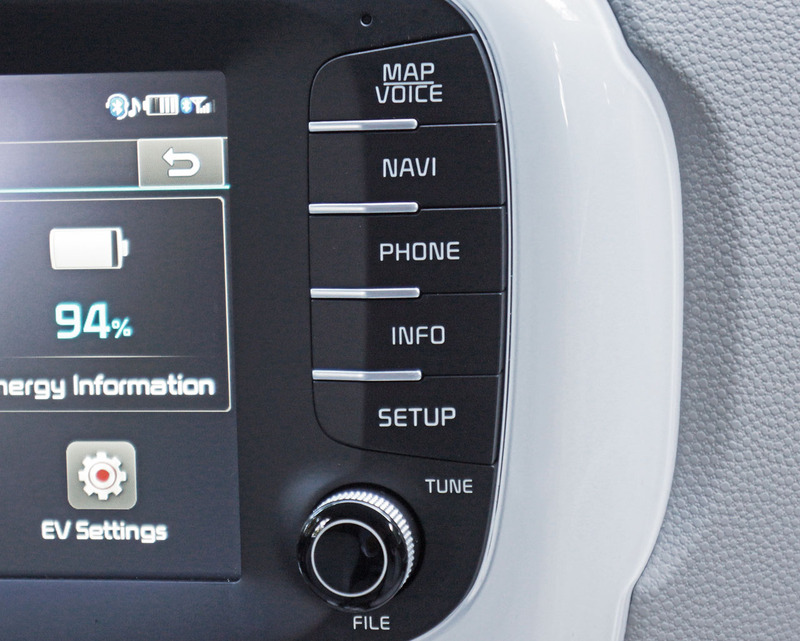 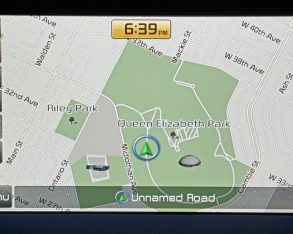 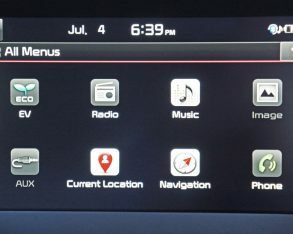 After working well for the first couple of days, the UVO infotainment system’s Bluetooth hands-free wouldn’t let me hear the other person during incoming and outgoing calls, forcing me to delete and reconnect my phone. 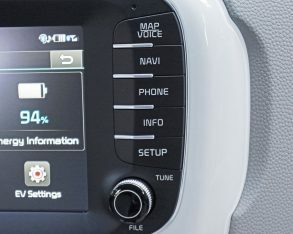 For the sake of transparency I was using my fairly new Samsung Note 4, which has worked faultlessly with every other Kia and every other brands’ wireless phone connectivity system. 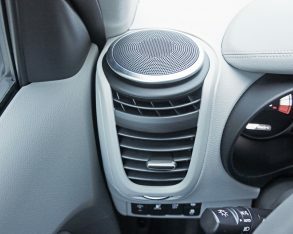 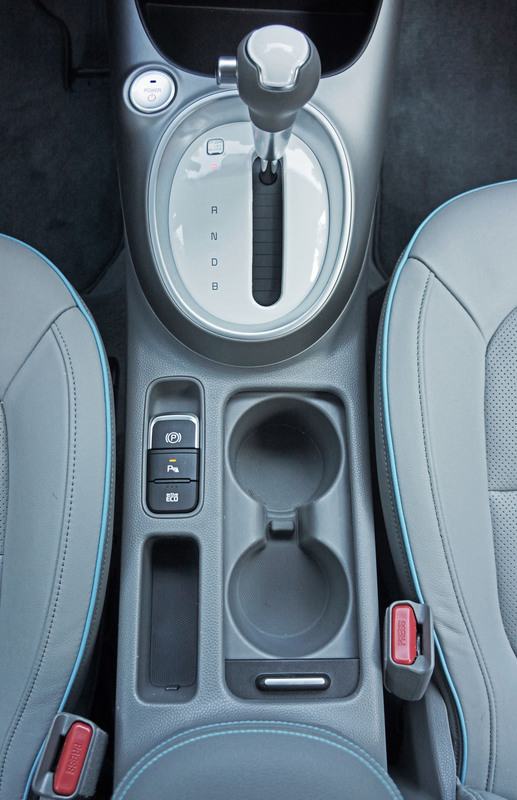 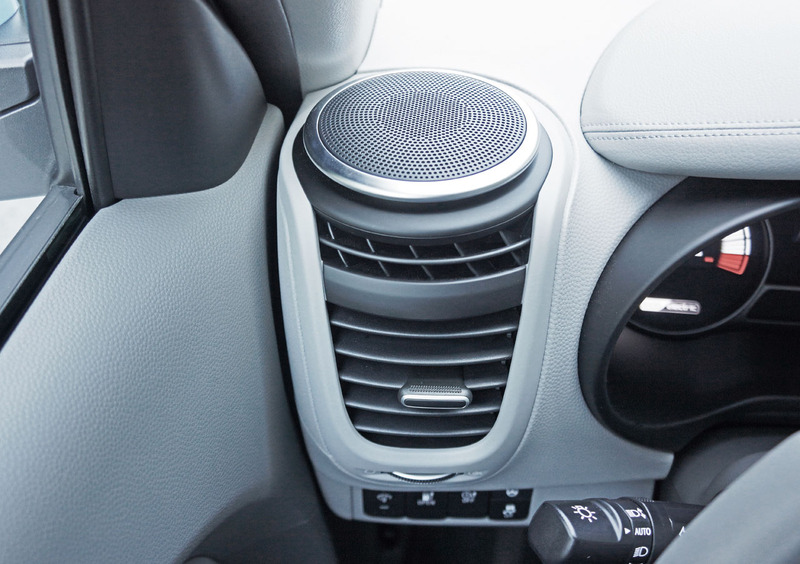 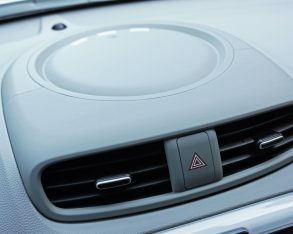 What it did very well, however, was pre-cool the interior while charging, a welcome feature on a hot summer’s day. 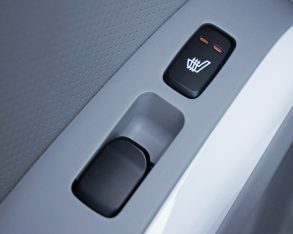 It’ll pre-heat during the winter months too. 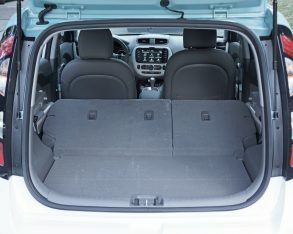 which while stated is slightly smaller than the regular Soul’s total luggage volume, is still class-leading at a very sizable 532 litres (18.8 cubic feet) when the standard 60/40 split-folding rear seatbacks are upright, and an even more commodious 1,402 litres (49.5 cubic feet) when they’re laid flat. 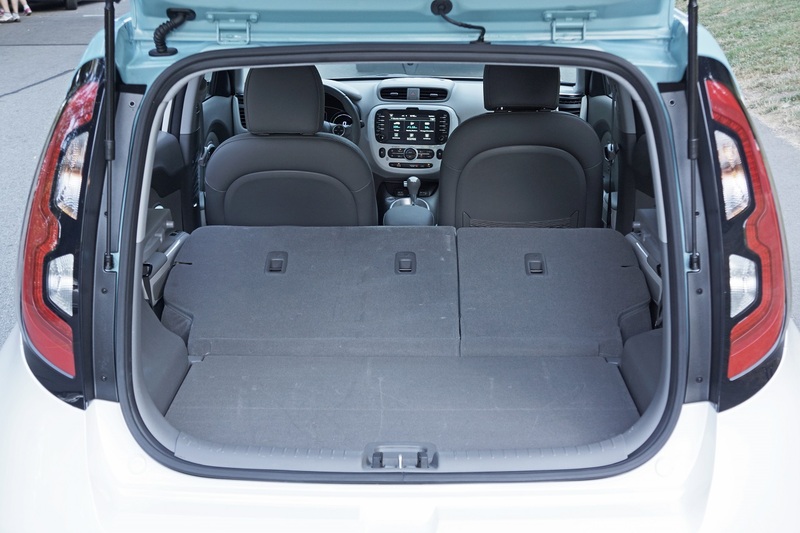 That’s a lot of loading space for any car, let alone an electric, all made possible because the Soul EV’s battery pack is a thin, flat design located below the floor, freeing space above. 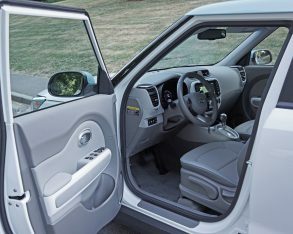 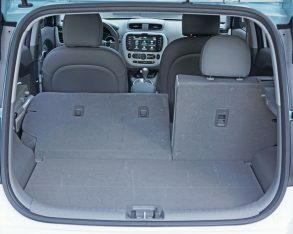 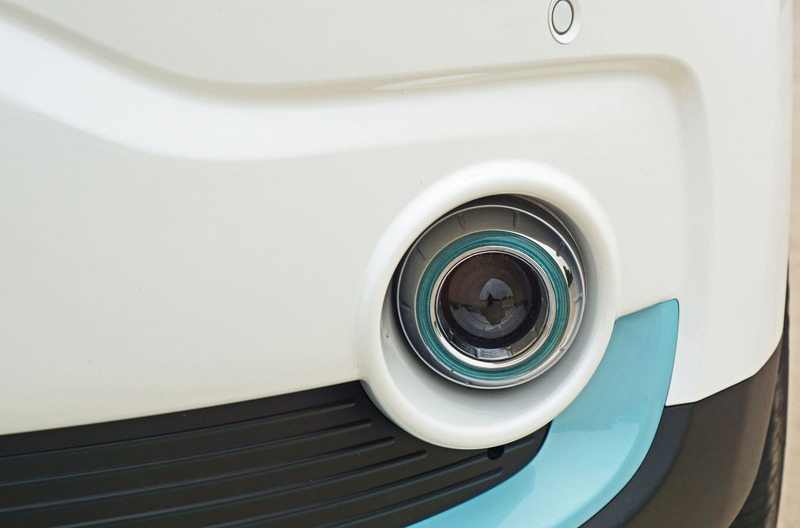 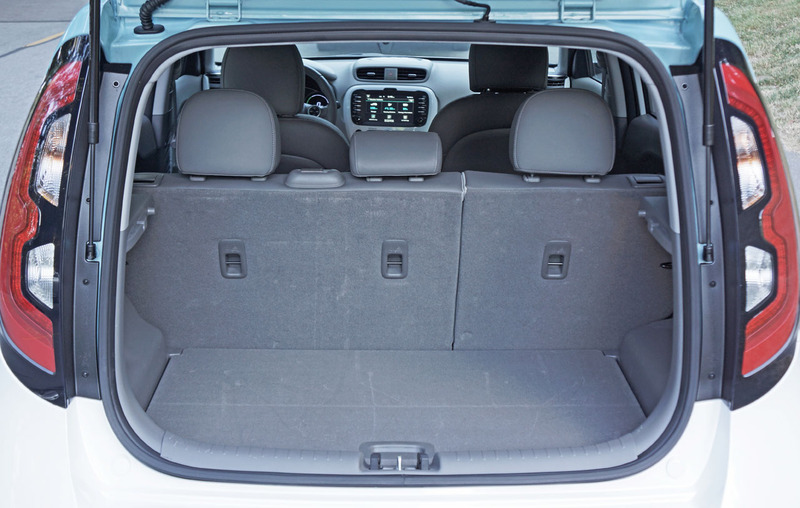 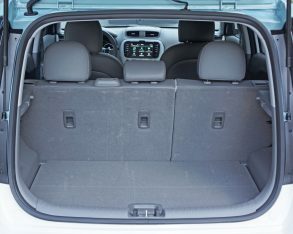 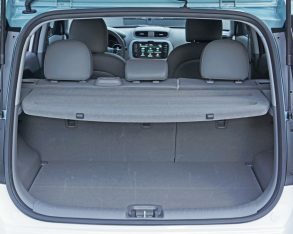 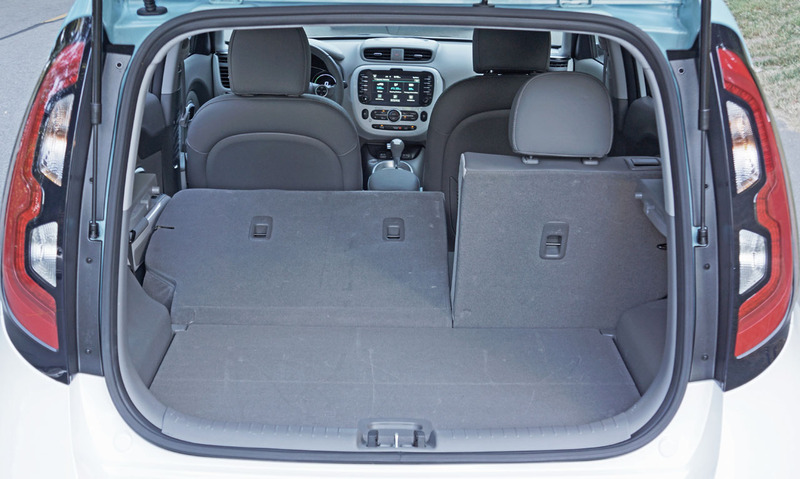 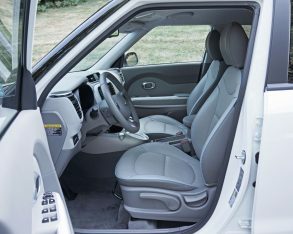 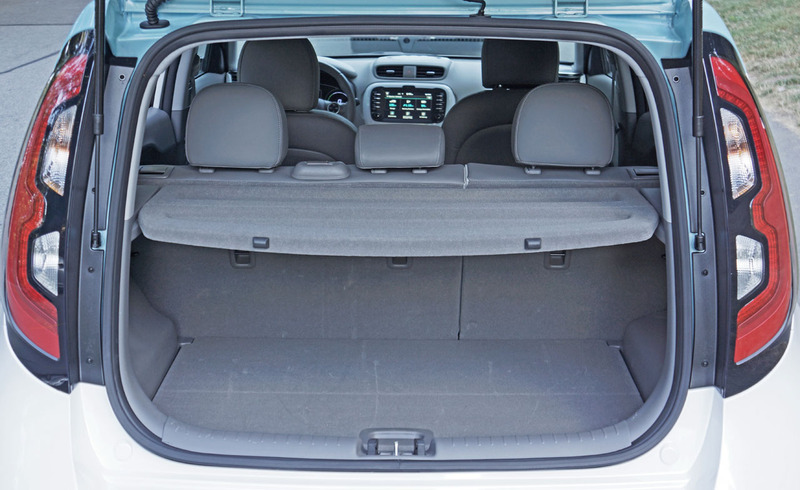 Most electrics and hybrids house their motive batteries in the rear bulkhead, which robs cargo space. 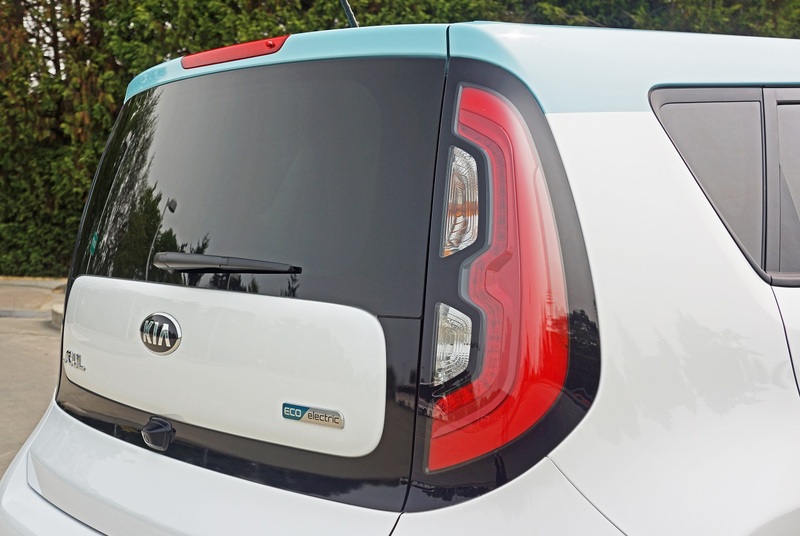 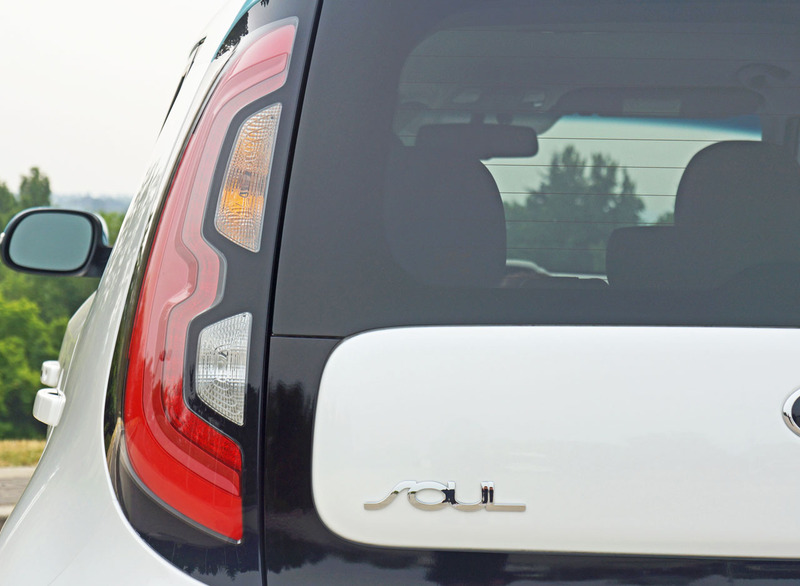 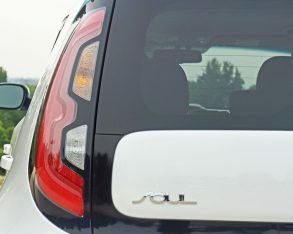 Maybe Kia really did design the Soul to be an electric from onset? 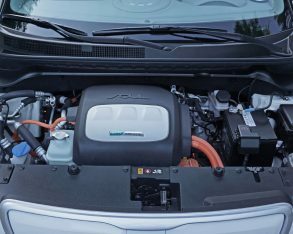 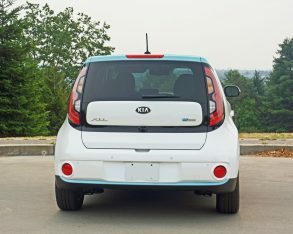 stability on the highway, while its ride is also quite compliant, and the Soul EV gives up nothing to its gasoline-powered sibling. 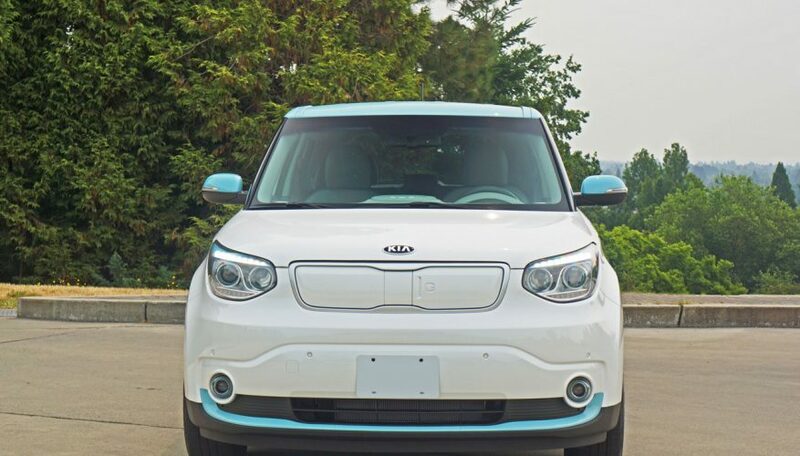 I thoroughly enjoyed driving it around town, never feeling harshness from the suspension, while a couple of trips on the highway showed that the little EV could certainly run with the big boys. 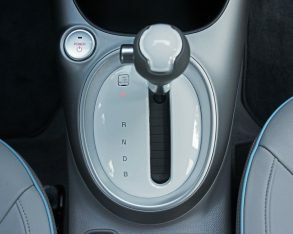 The brakes were good as well, and not too grabby as is often the case with EVs and HEVs, the grabbiness due to regenerative braking systems that capture normally wasted kinetic energy from the braking and coasting process and then feed it back into the battery. 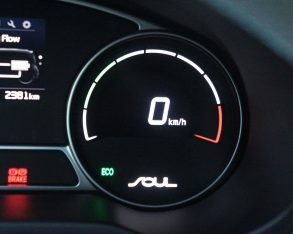 Despite incorporating the same type of regenerative braking system, the Soul EV’s brakes were very smooth. 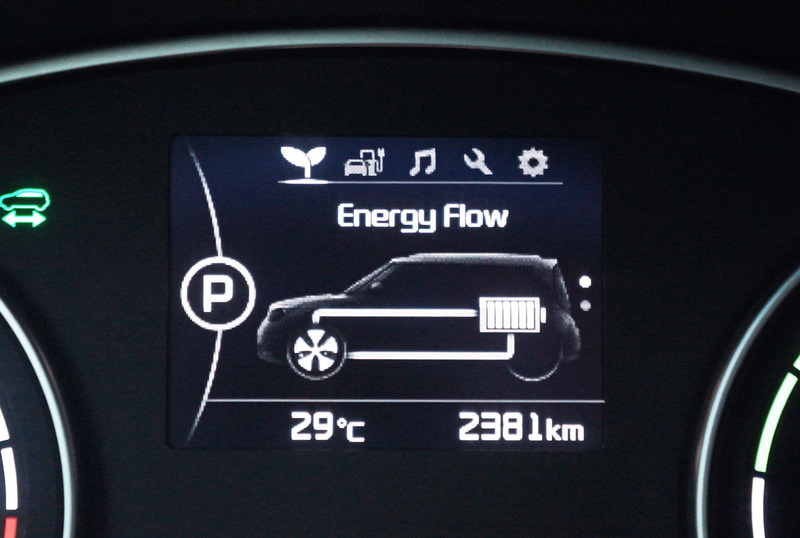 the highway, which really doesn’t mean all that much to me because, as mentioned, all the power was free. 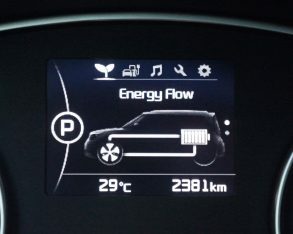 If you’re going to be recharging at home, suffice to say you’ll be saving loads compared to gassing up a conventionally powered Soul at the pump. 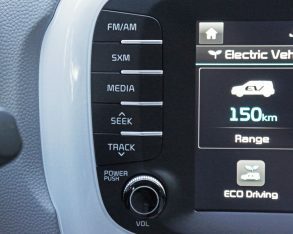 automakers are producing enough EVs to bring the price down, plus advancements in batteries do likewise. 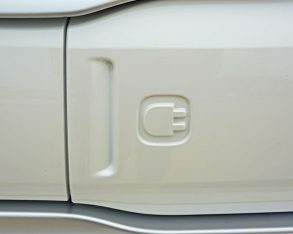 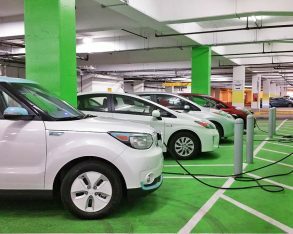 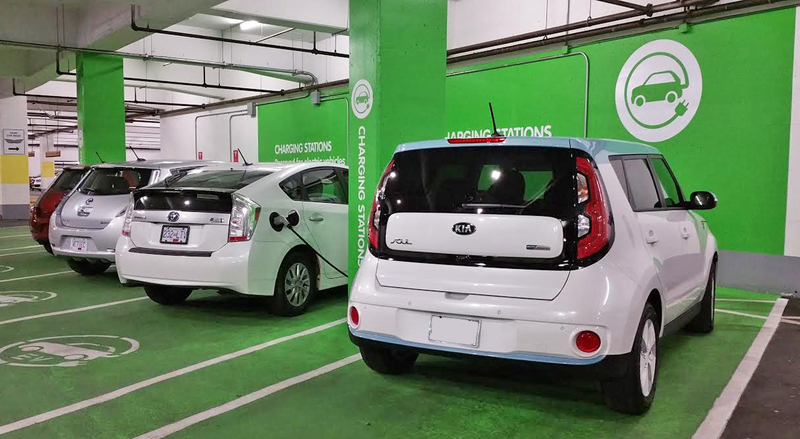 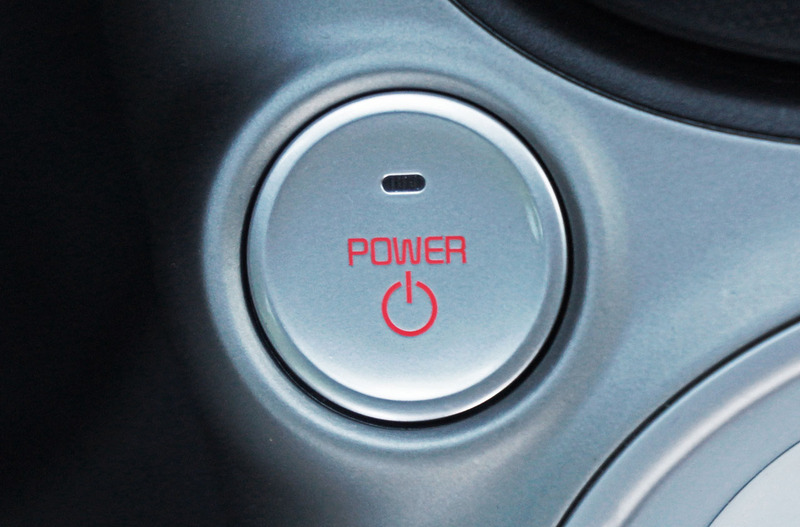 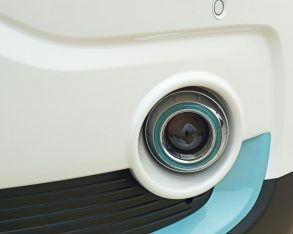 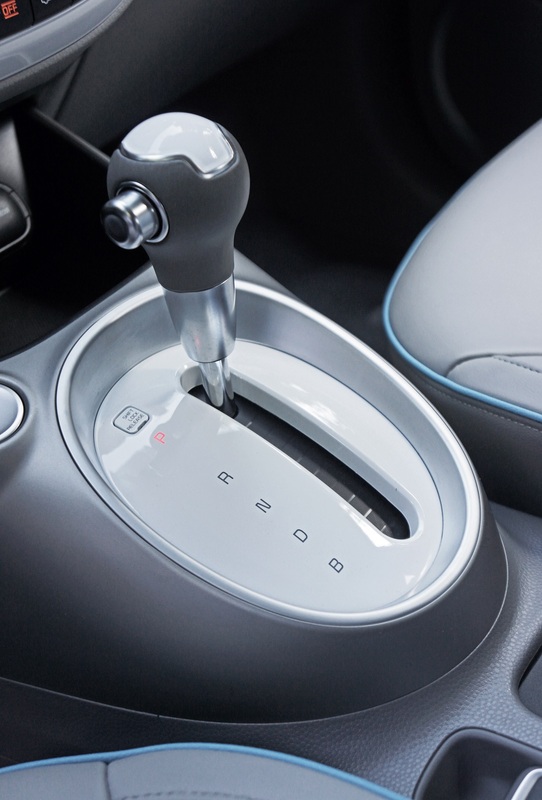 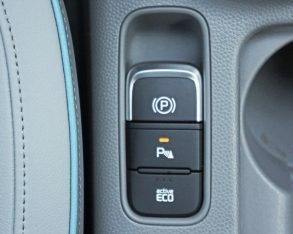 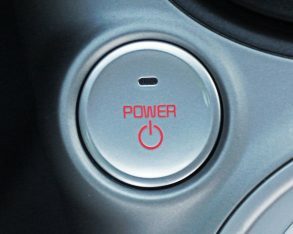 For the time being some of our provincial governments have stepped up to make plug-in ownership more affordable and hopefully tempt we car buyers into taking the plunge, with BC offering a $5,000 rebate, Quebec $8,000 and Ontario $8,500. 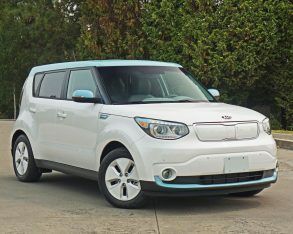 Would a $26.5k to $30k Kia Soul woo you? 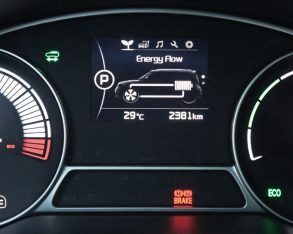 Even if your fuel bill was reduced to zero? 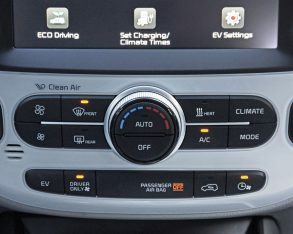 Or are you motivated more by environmental issues. 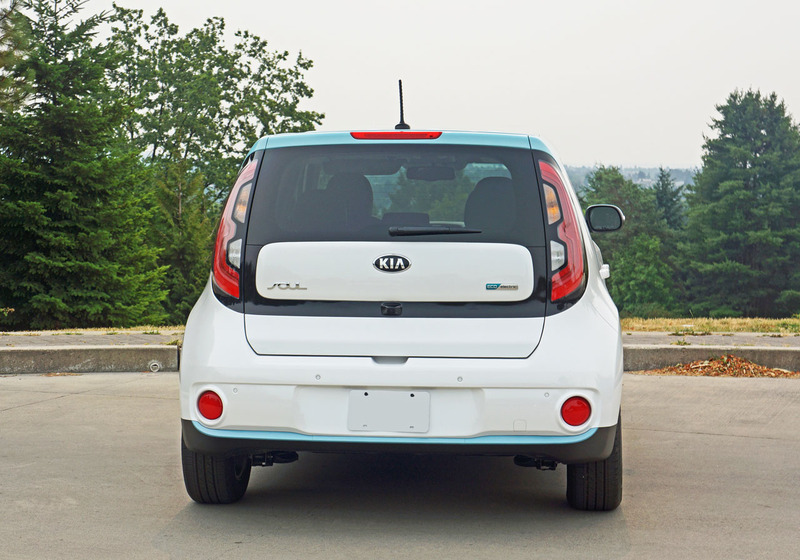 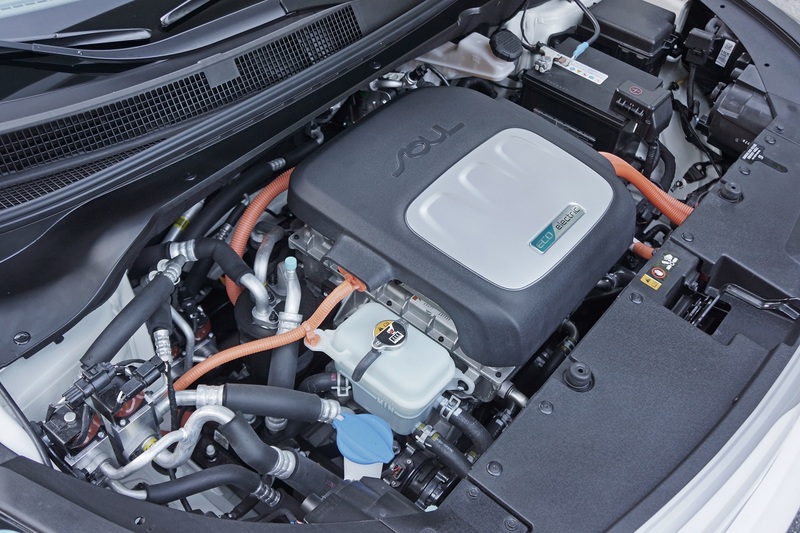 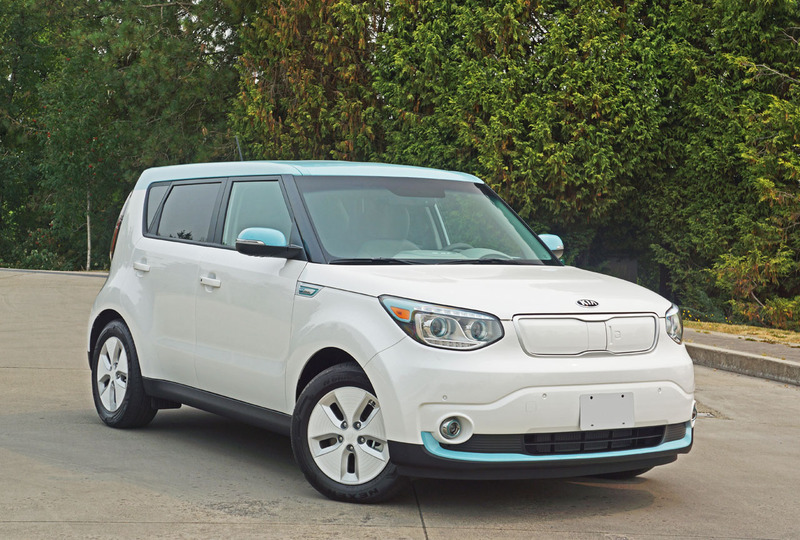 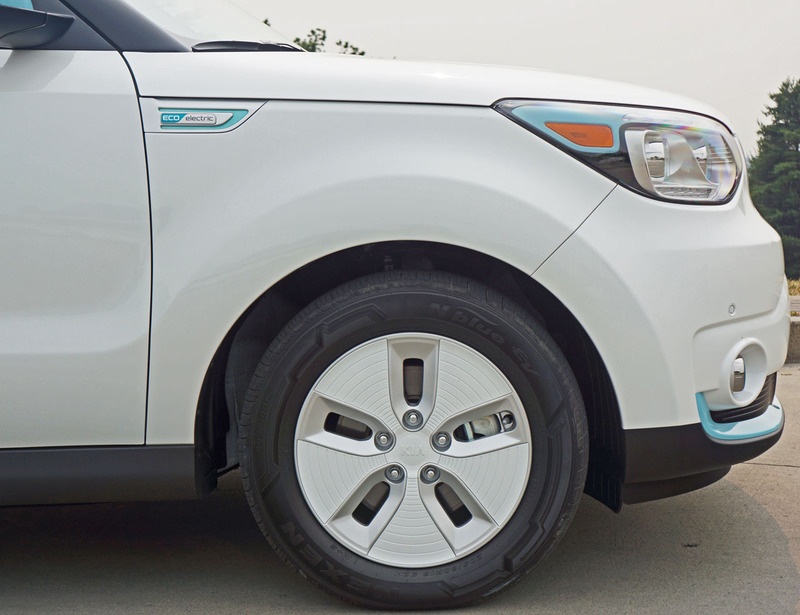 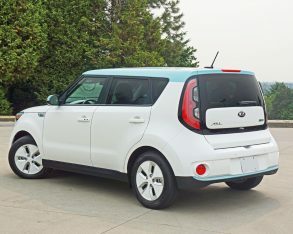 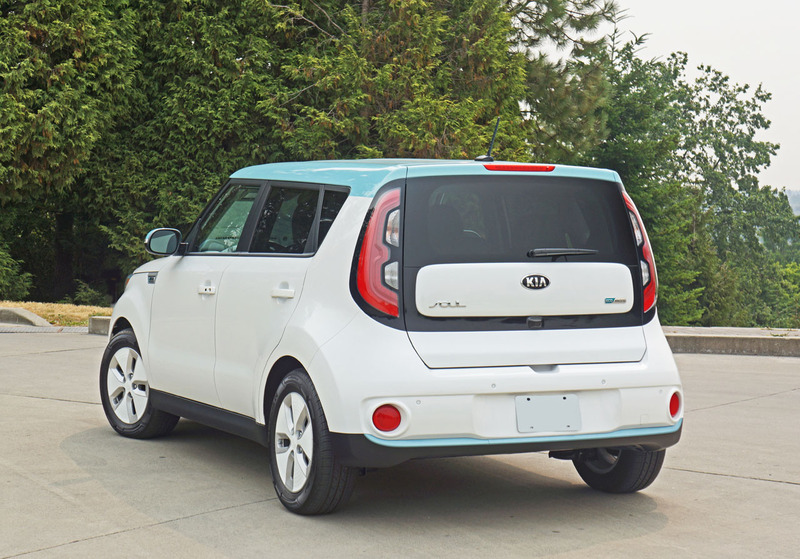 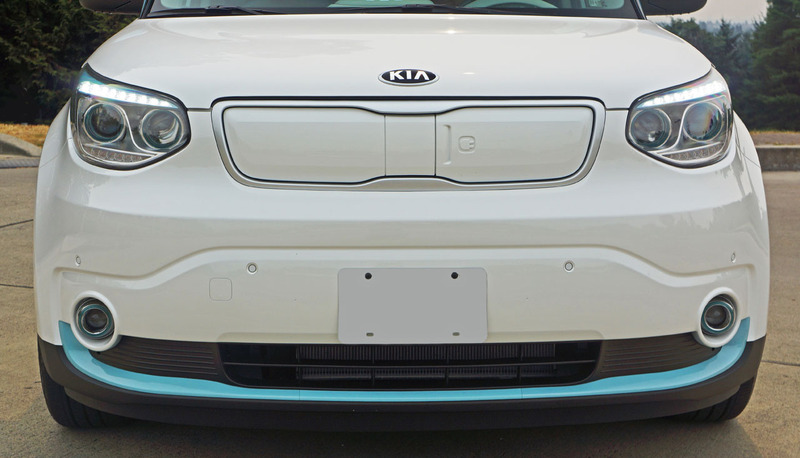 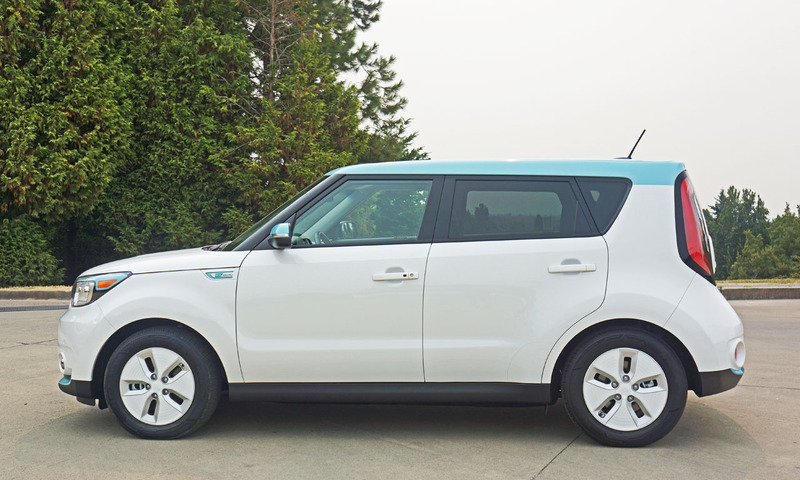 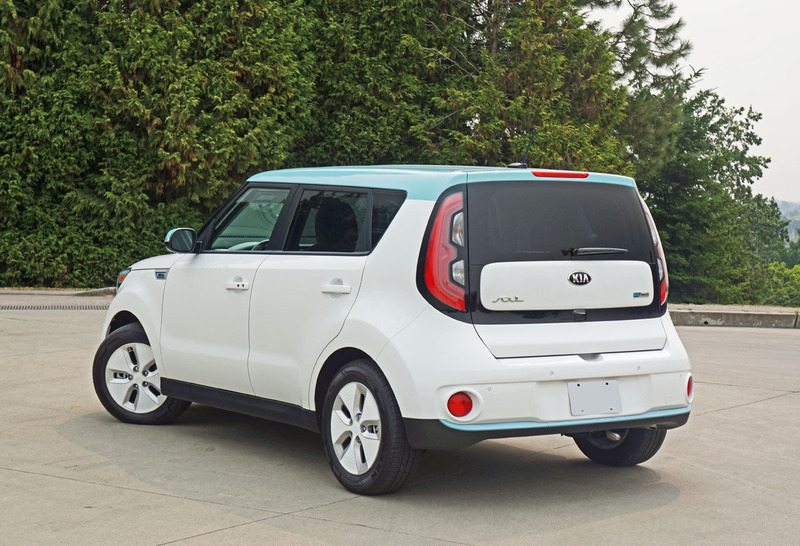 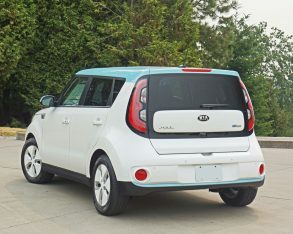 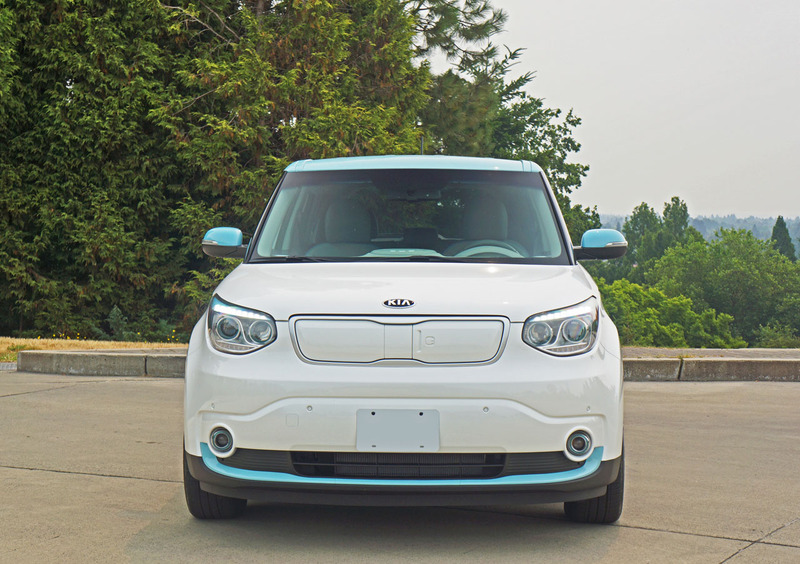 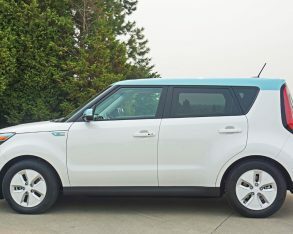 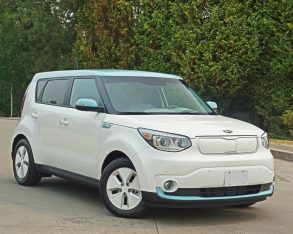 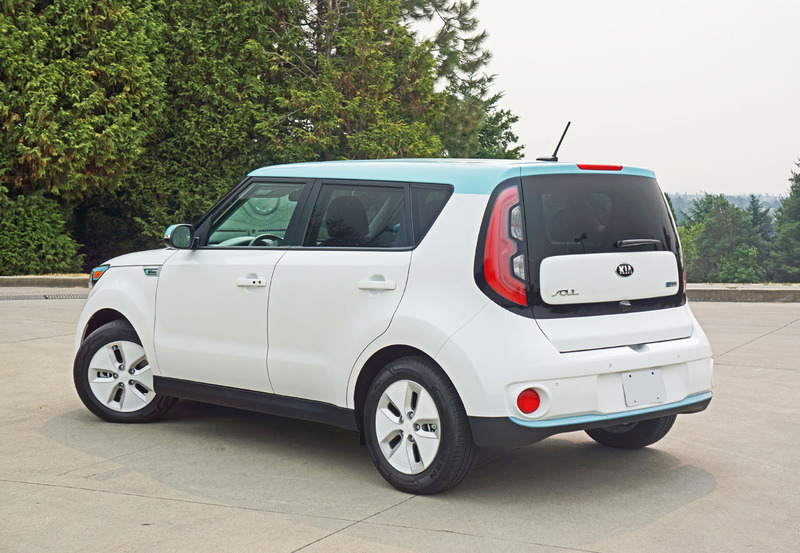 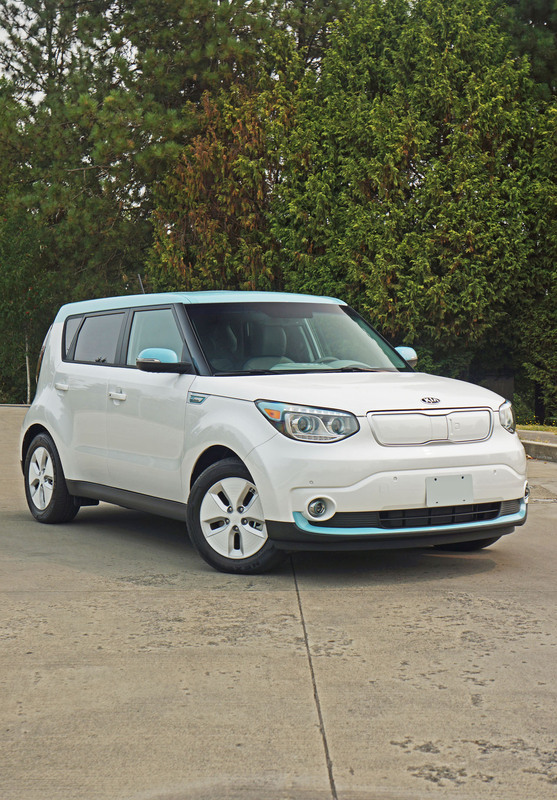 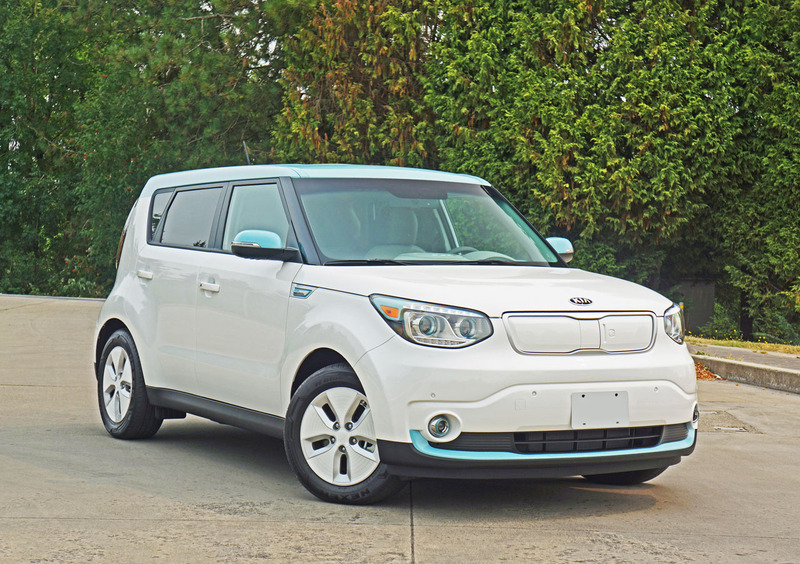 Either way, the Kia Soul EV is an excellent way to experience electrified motoring.